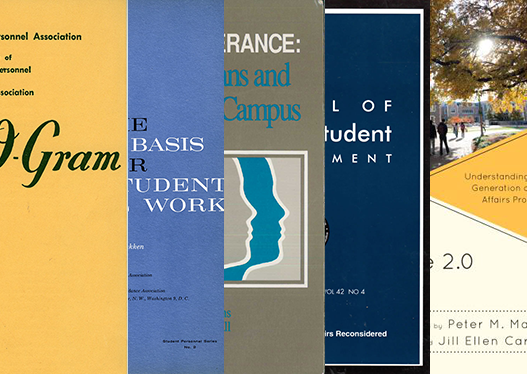 From the first Personnel-O-Gram to our most recent books and monographs, ACPA has a long history of providing timely and relevant publications for the student affairs profession. 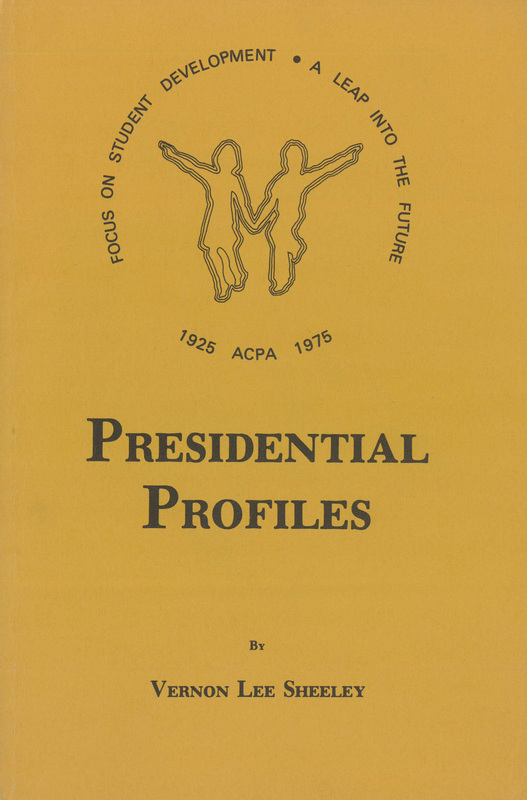 Browse through this timeline to see the scope of the ACPA’s contributions to the literature of the field. 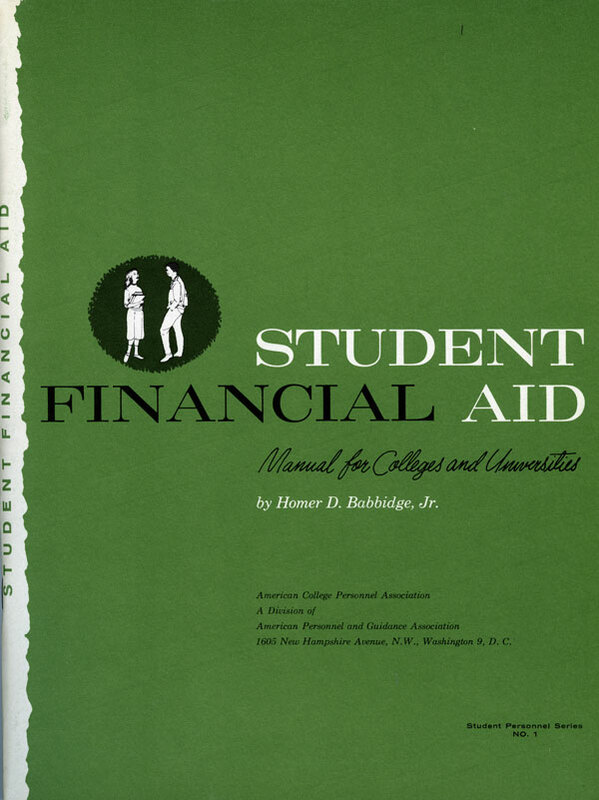 You will be able to download and or purchase some of the items. 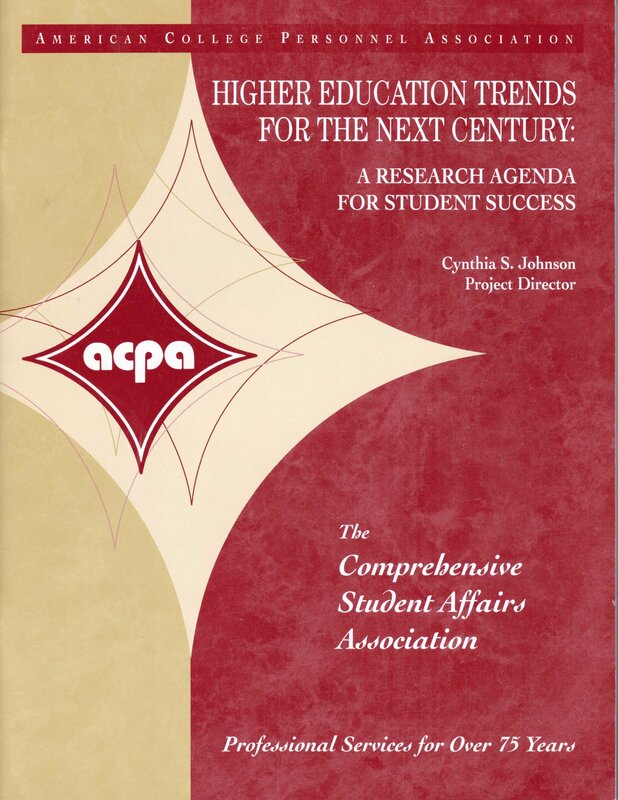 If you believe we should add or update a document, please e-mail us at info@acpa.nche.edu. 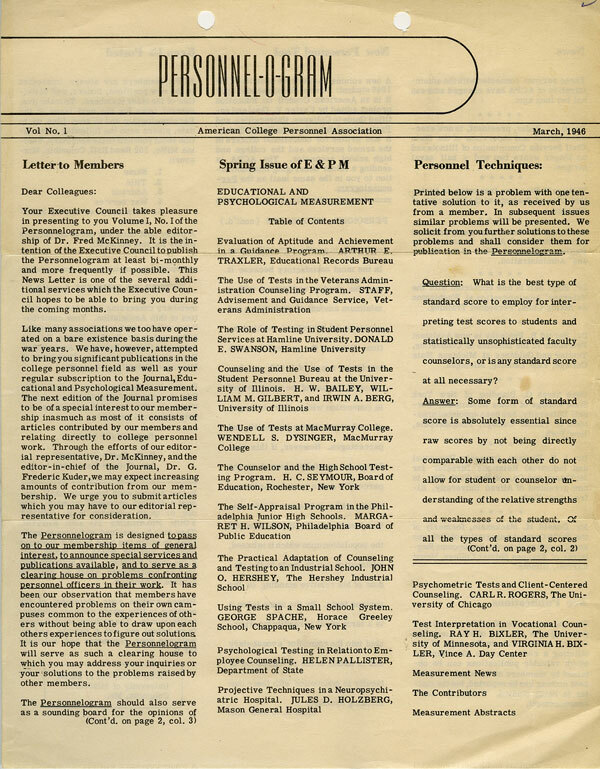 The Personnel-O-Gram provided items of general interest, announced special services and publications available, and served as a clearinghouse for problems facing the field. 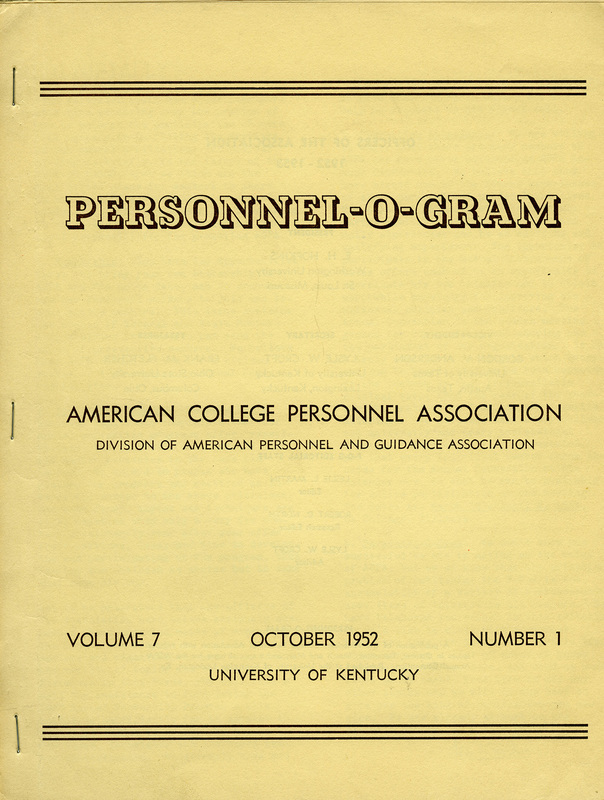 In 1949, ACPA President C. Gilbert Wren reported in the Personnel-O-Gram the composition of ACPA members. 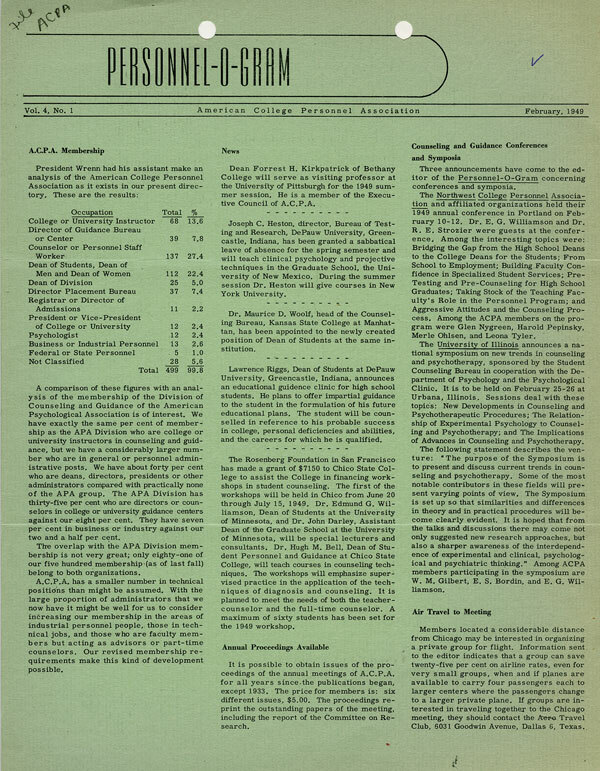 ACPA debated the cost of $50 an issue (for a total of $400 for the 8 issues anticipated for 1952). 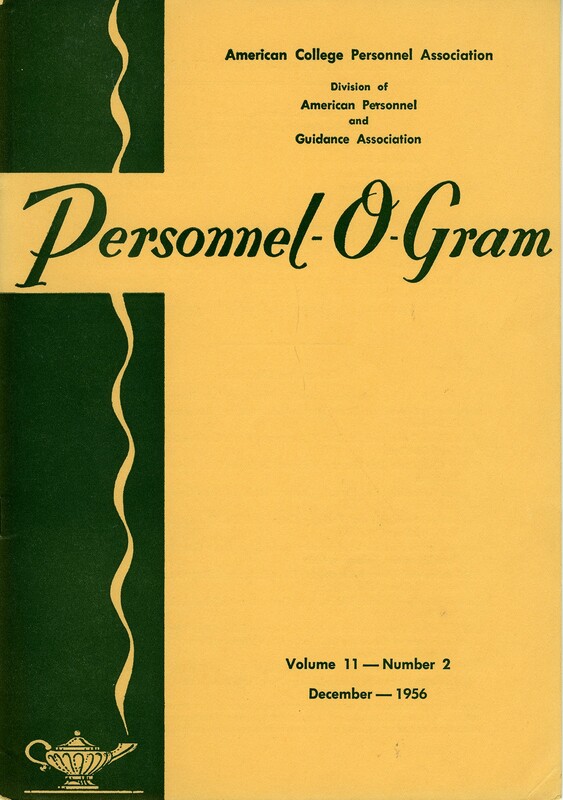 The Personnel-O-Gram begins to evolve from a newsletter to a more formal publication. 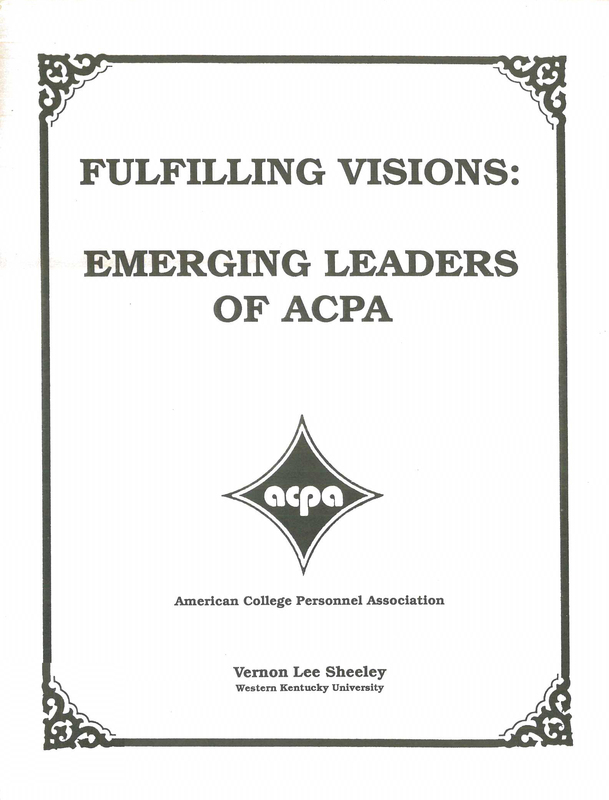 The Newsletter/Journal begins to includes ACPA annual conference proceedings and the directory of members. 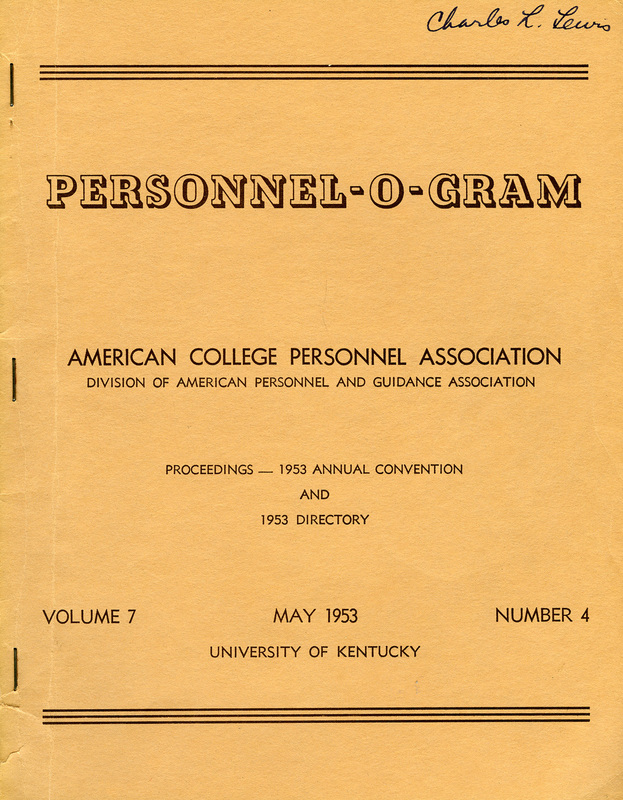 ACPA's Personnel-O-Gram in the mid-1950s. 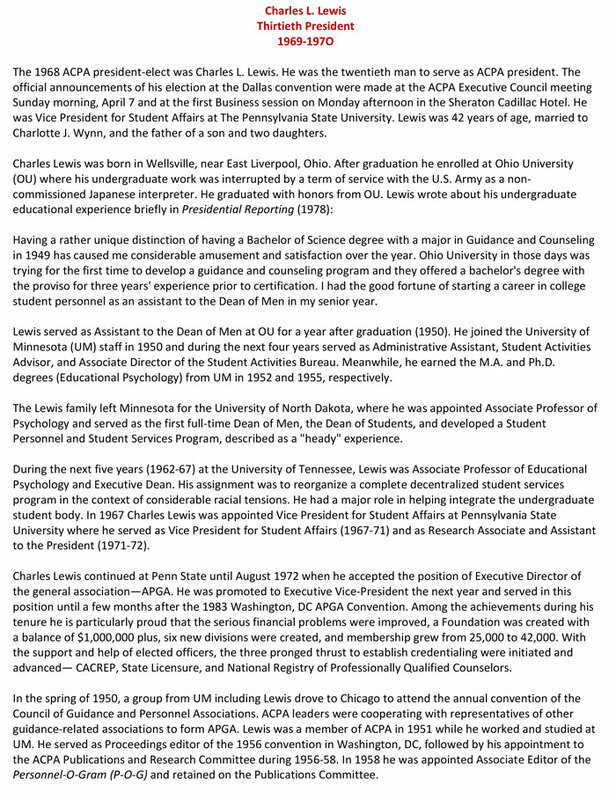 Charles L. Lewis (Editor, 1958-1964) served in various professional student affairs/higher education positions and contributed to ACPA throughout his life. 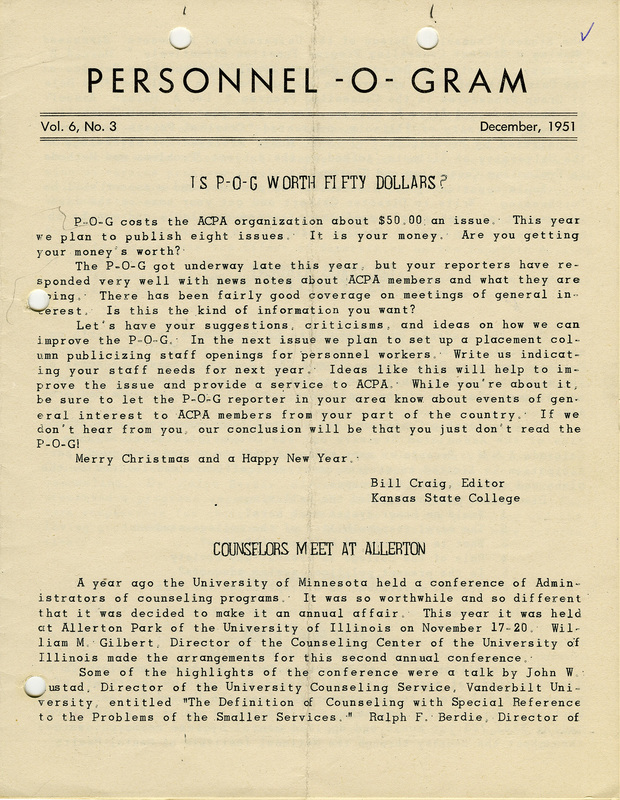 In the fall of 1959, ACPA announces the new journal title and format that replaces the Personnel-O-Gram, the former newsletter/journal that had served multiple purposes to that point in the organization. 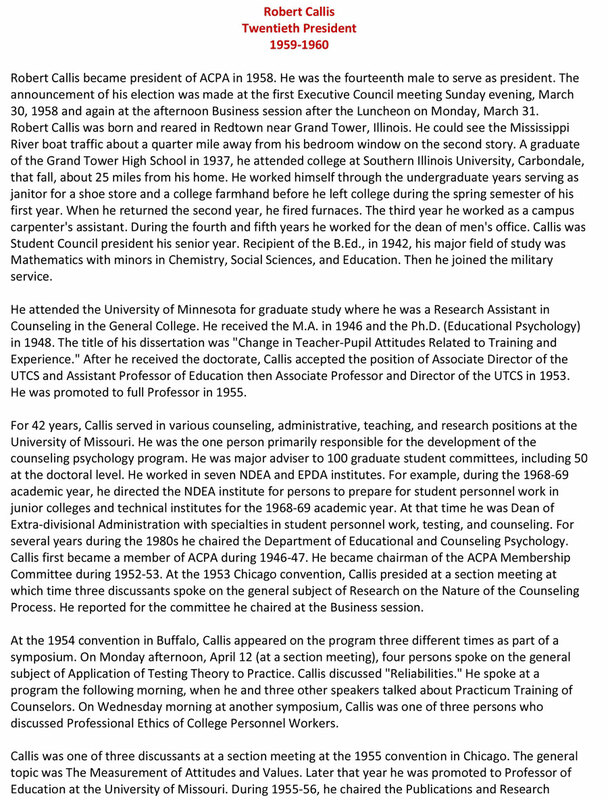 Robert Callis (2nd editor of JCSP) spent his entire professional career at the University of Missouri and held leadership positions in ACPA. 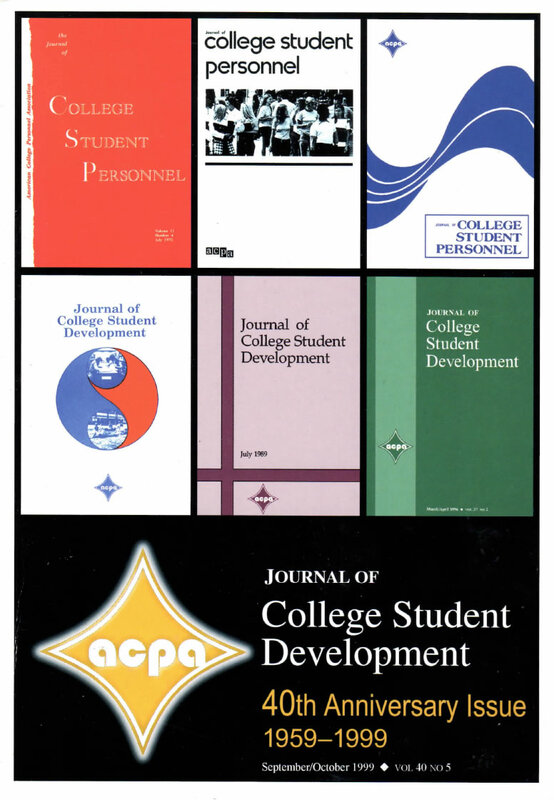 After six years of JCSP, ACPA initiated a design change for the journal. 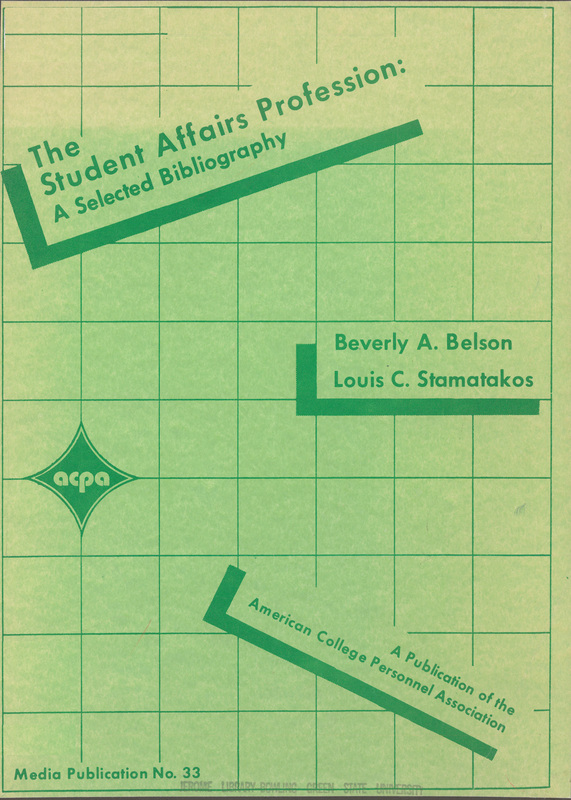 An active member of ACPA and extensive author in the field, Albert B. 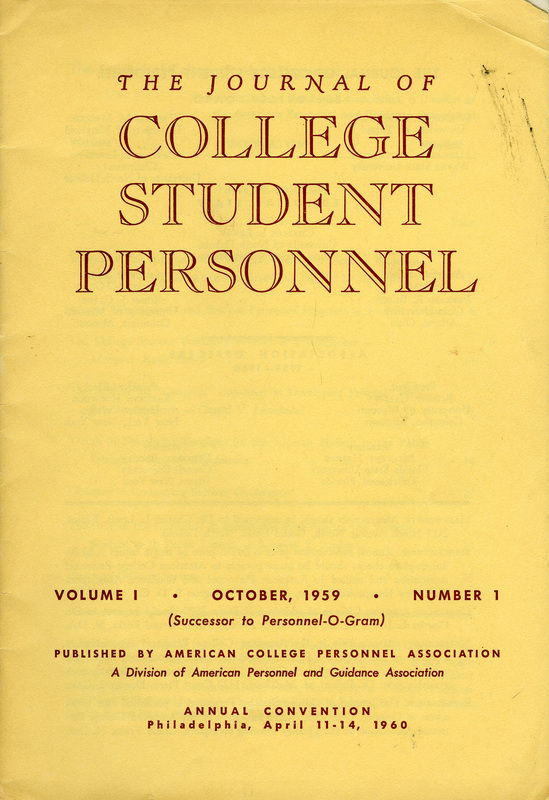 Hood served as the third editor of The Journal of College Student Personnel. 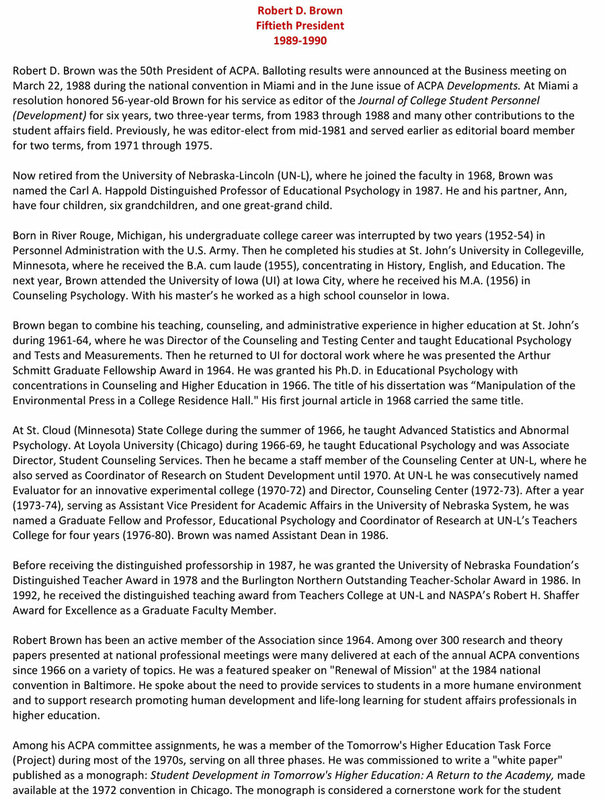 Hood was a recipient of the ACPA Contribution to Knowledge Award, the ACA Extended Research Award, and the NASPA Robert H. Shaffer Award for Academic Excellence. 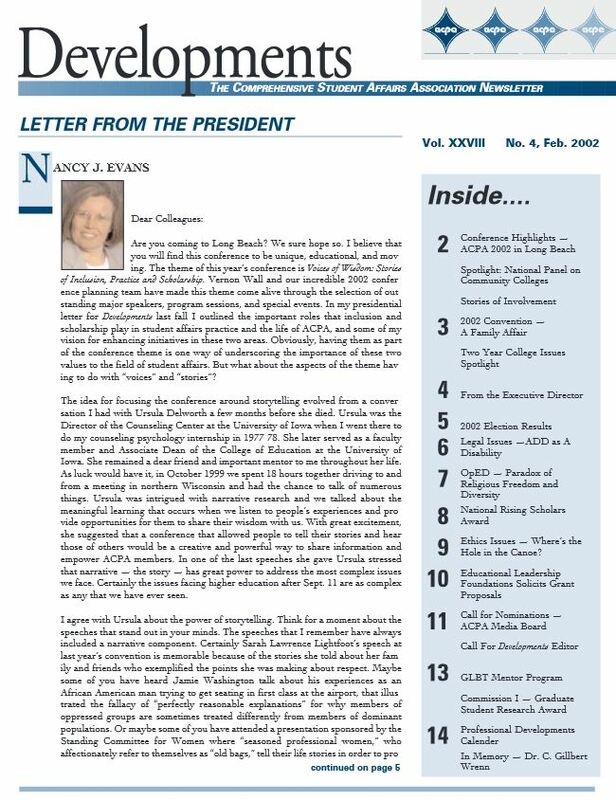 ACPA President M. C. Beryl sent what was meant to be the first "presidential newsletter," The Presidential Communique, to all ACPA members. 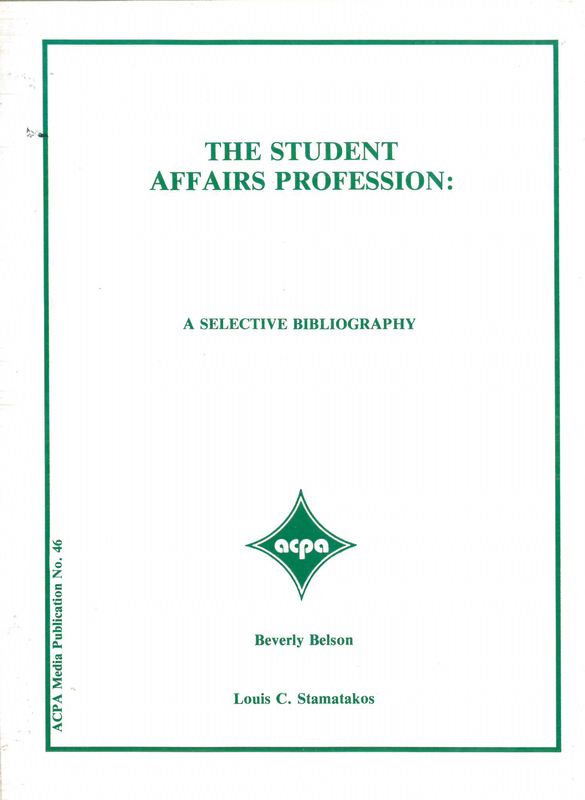 The newsletter was "… intended to serve as an information source" about "various aspects of ACPA activity." 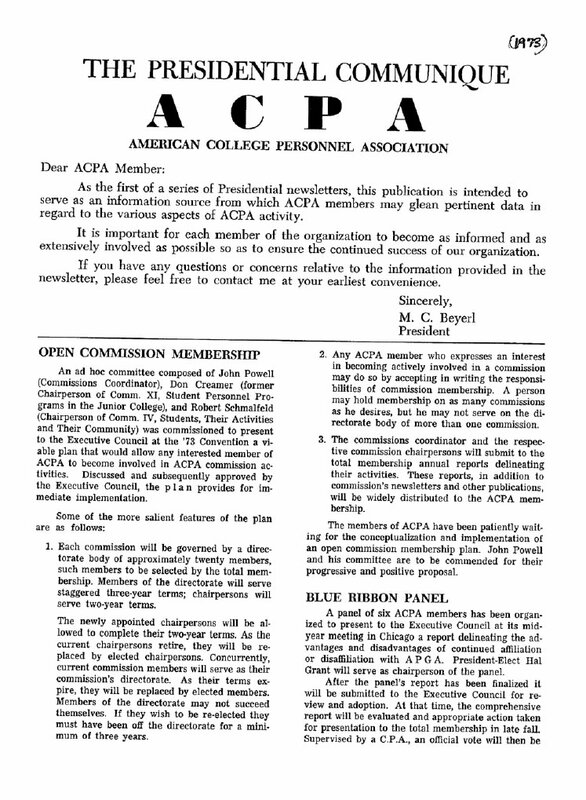 The newsletter included an update about an open membership plan for commissions and announcement of a "blue ribbon panel" to consider ACPA's continued affiliation with APGA (the American Personnel & Guidance Association). 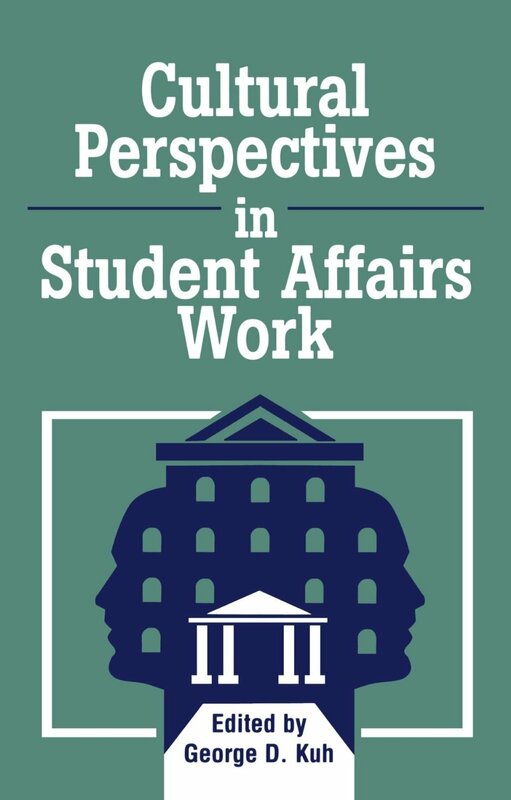 This monograph is comprised primarily of survey results on residence hall student staff with respect to their roles and responsibilities and provides examples of student staff training programs across a variety of institutions. 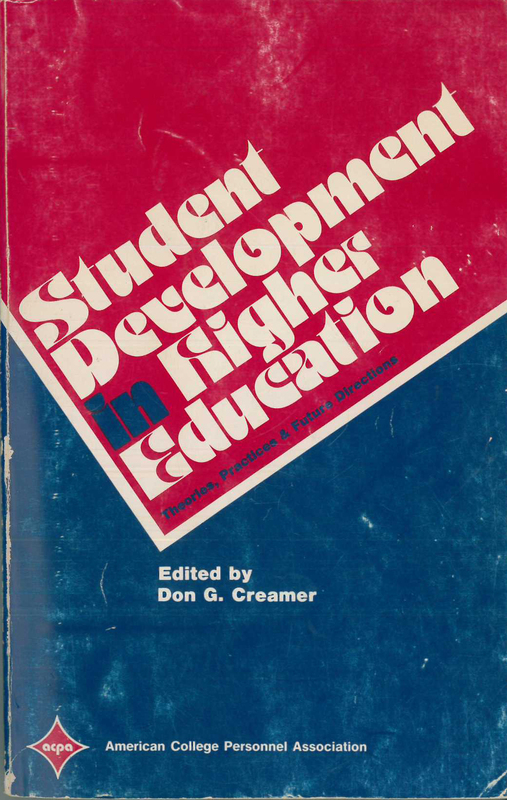 (Edited by Janet D. Greenwood and Barbara A. Lembcke). 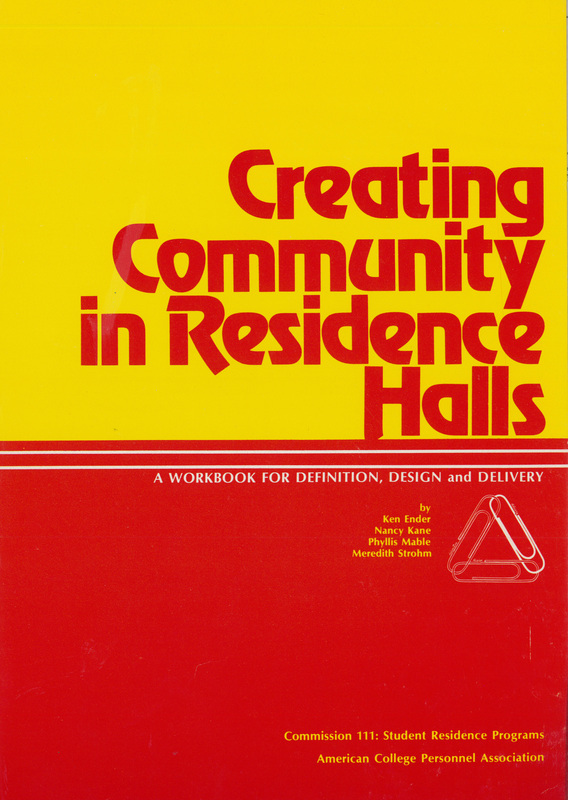 Designed as model building part of T.H.E. 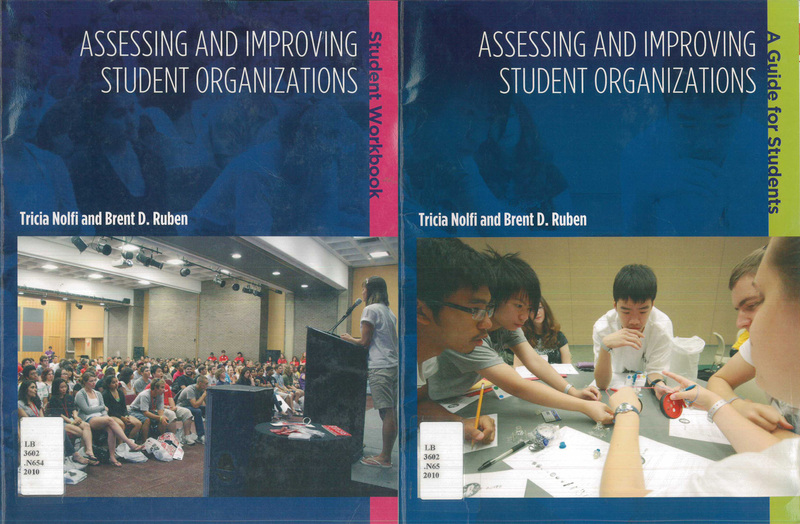 Project to develop new operational model for Student Affairs professionals. 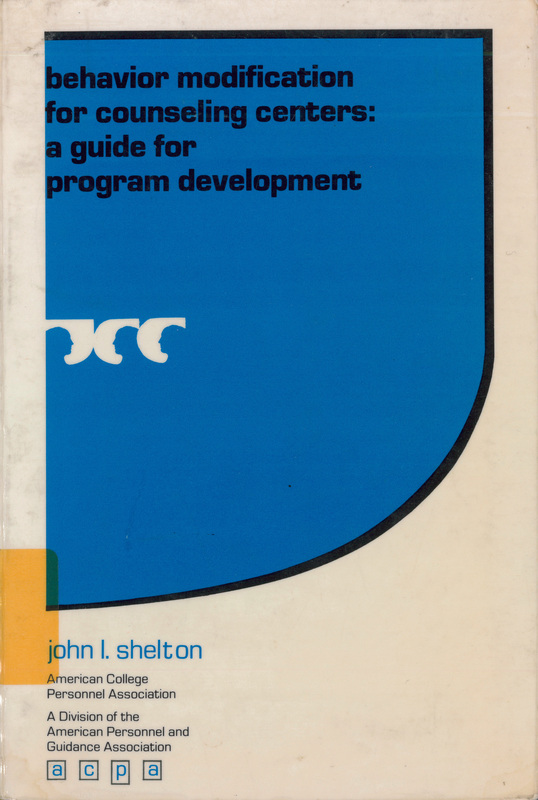 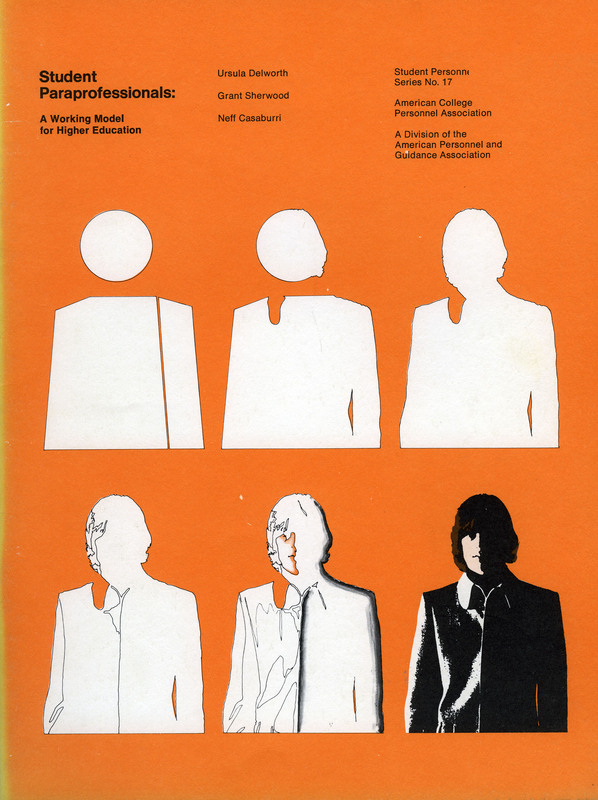 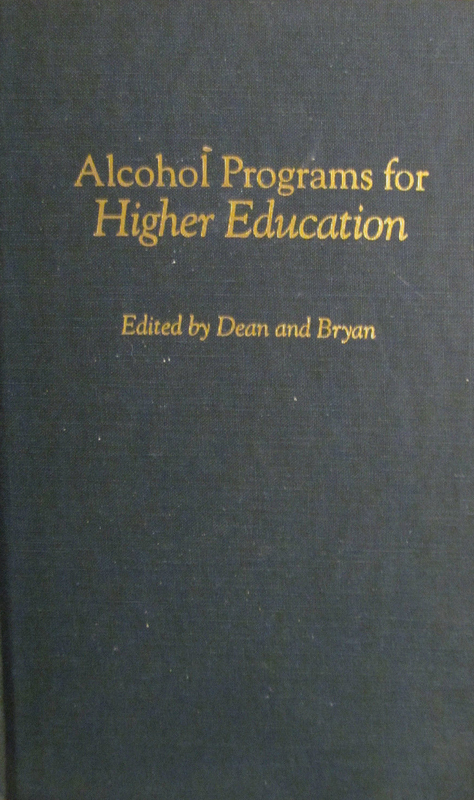 This is the follow up to Robert D. Brown's 1972 publication. 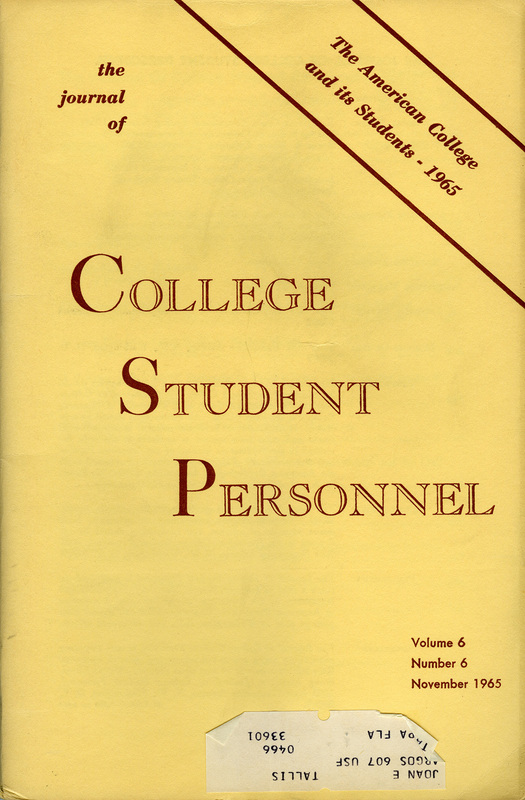 Laurine Fitzgerald served as the fourth editor of The Journal of College Student Personnel. 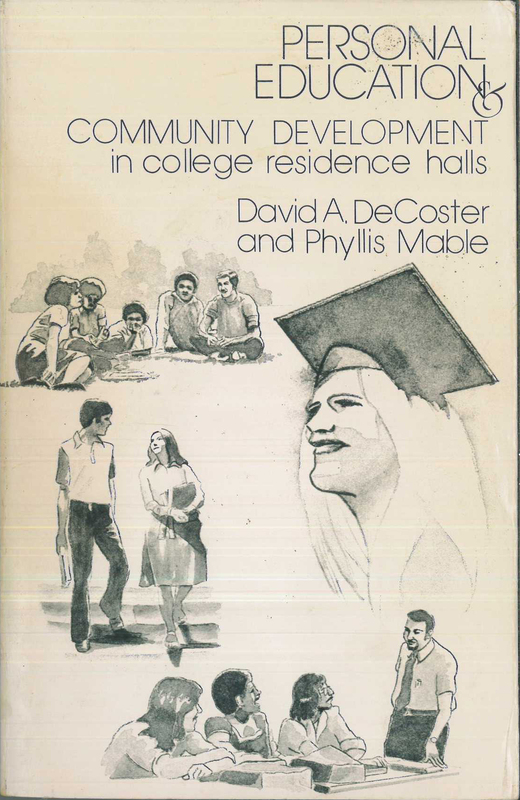 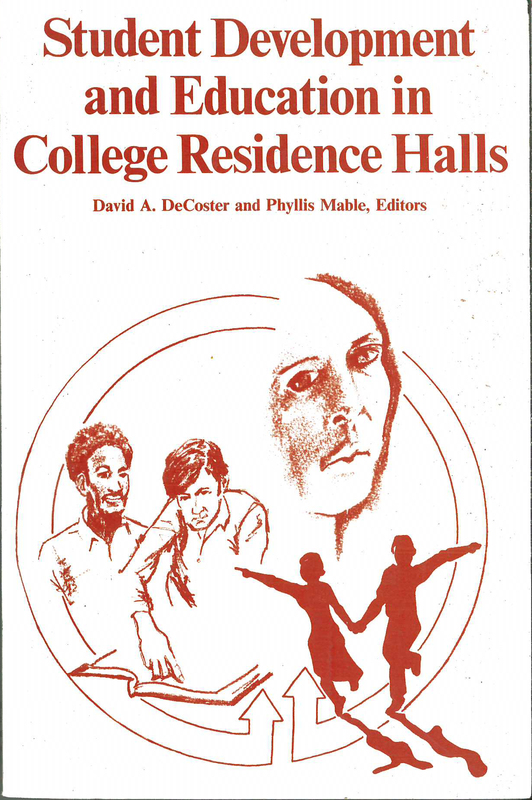 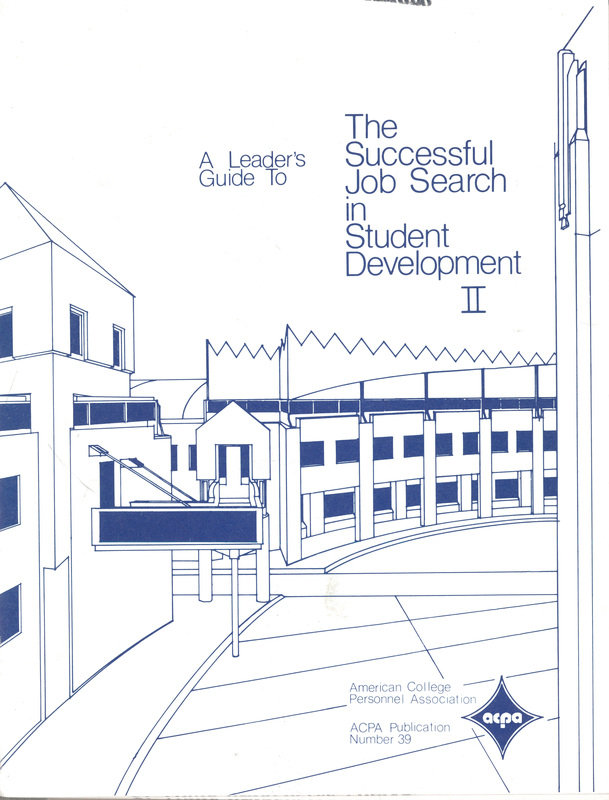 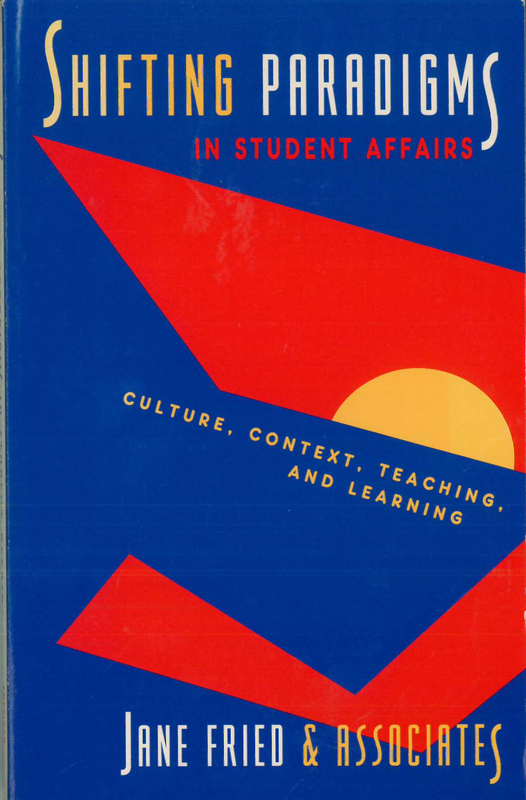 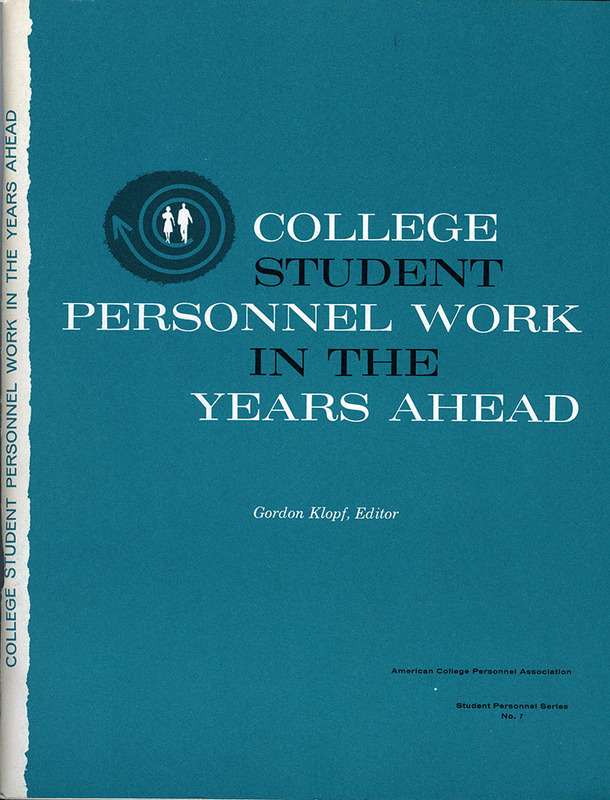 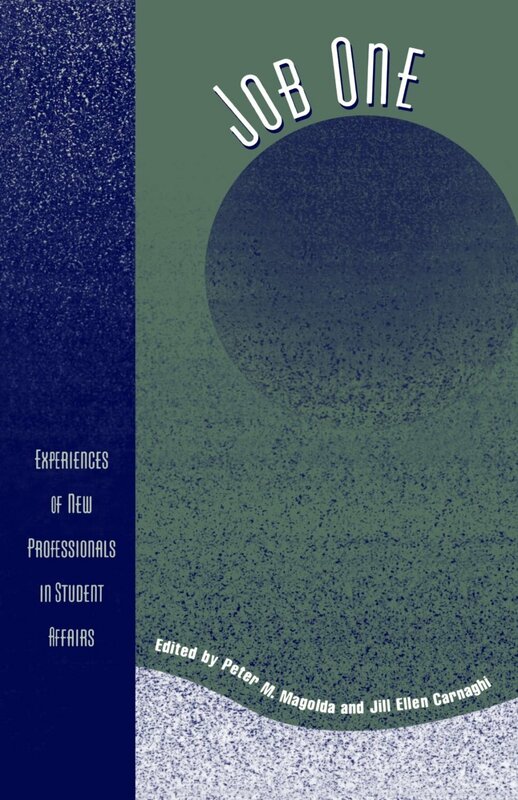 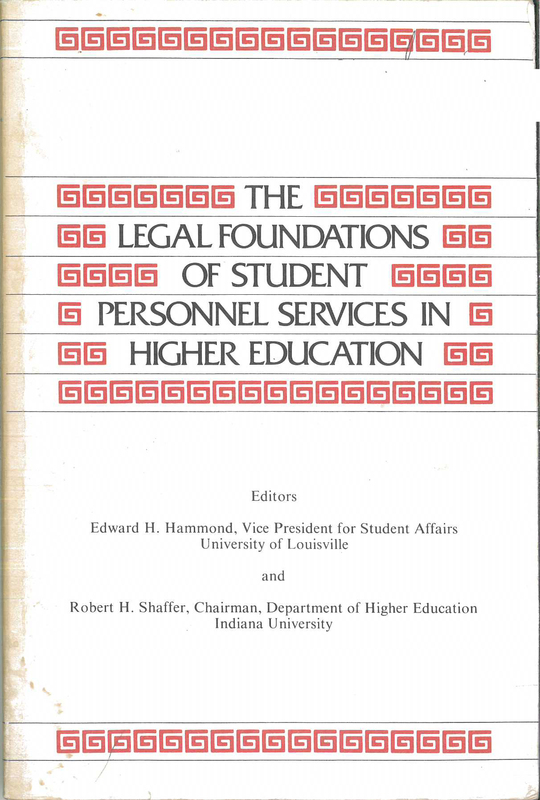 This monograph defines student personnel work and places it in a historical context. 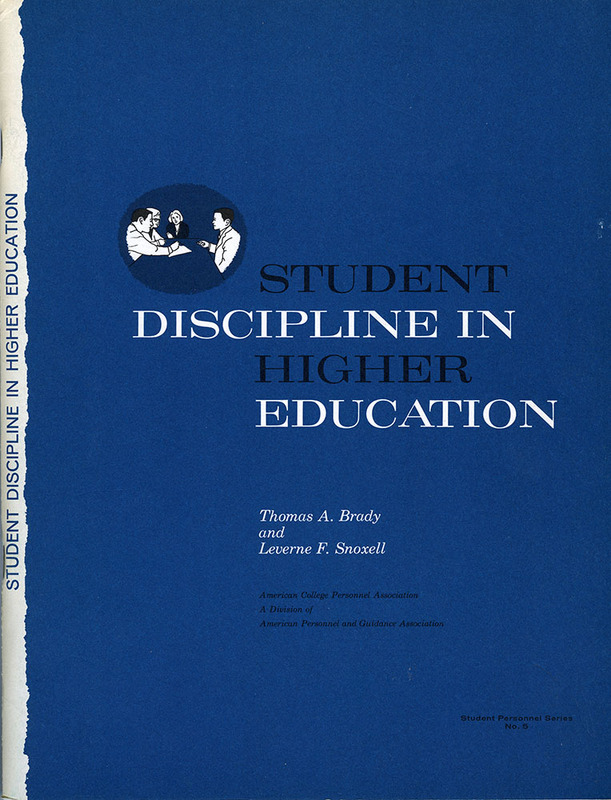 Student characteristics and student conduct are discussed in light of higher education institutional structures and student services. 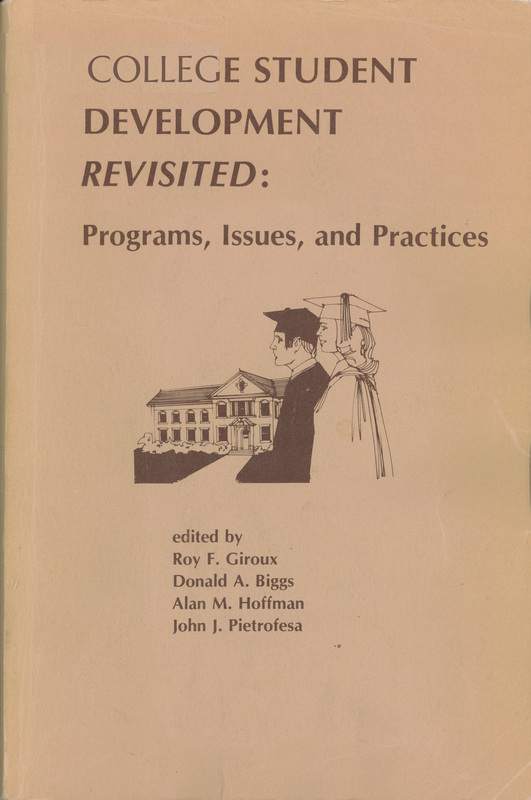 (Edited by Roy F. Giroux, Donald A. Biggs, Alan M. Hoffman, and John J. Pietrofesa). 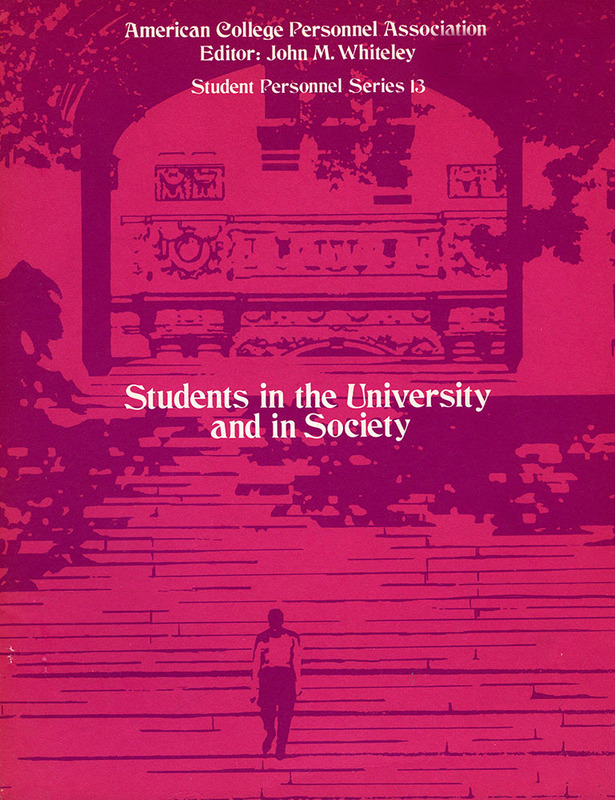 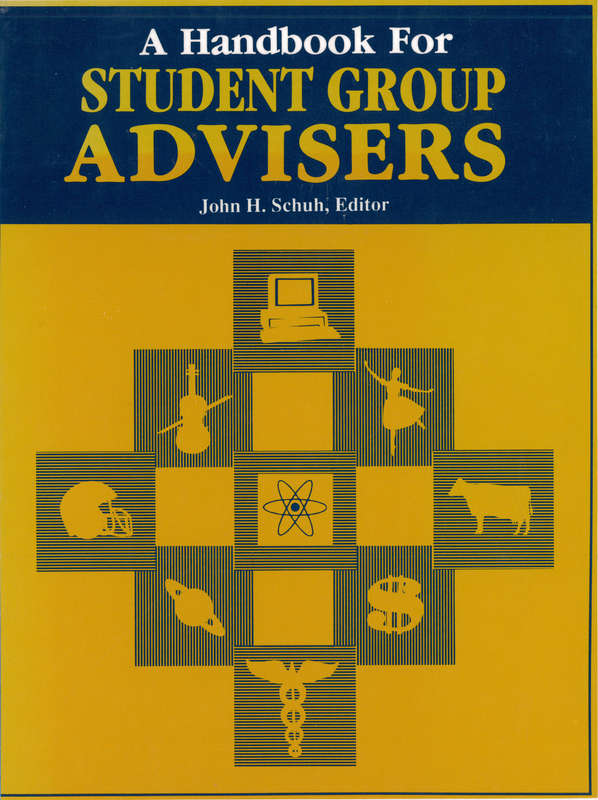 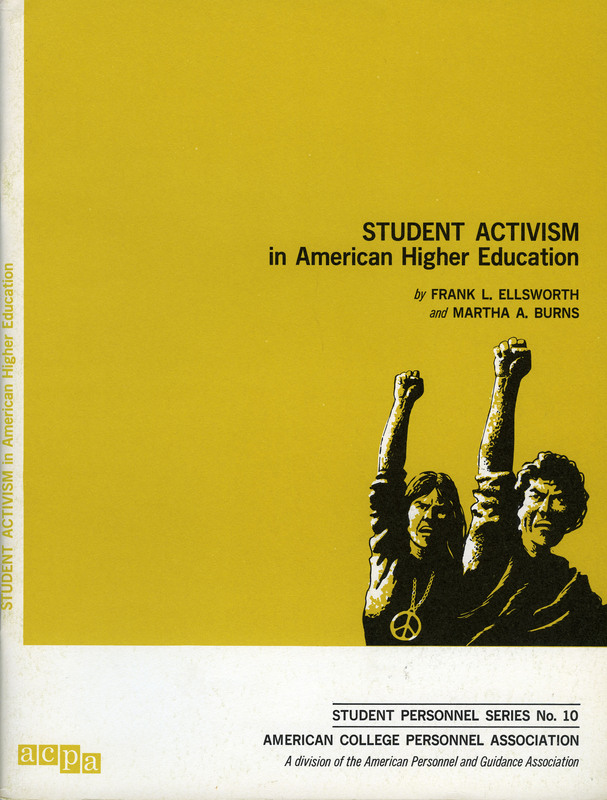 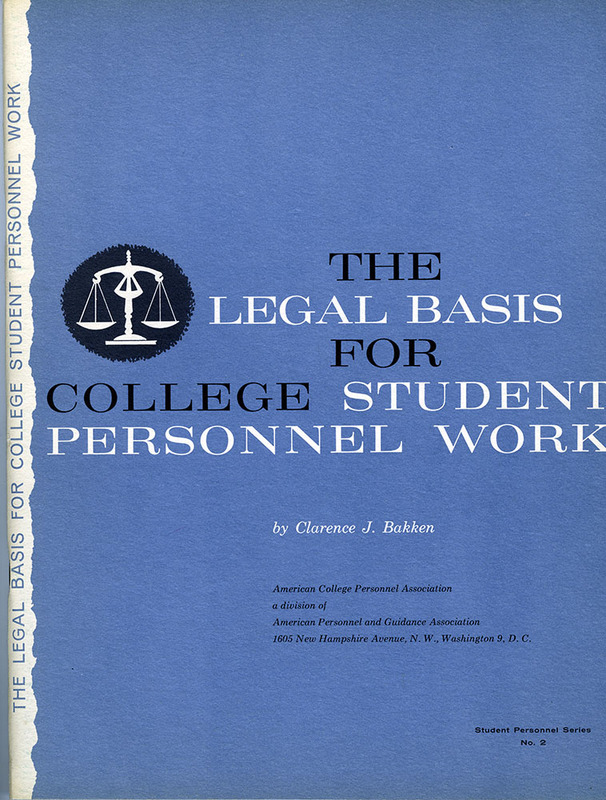 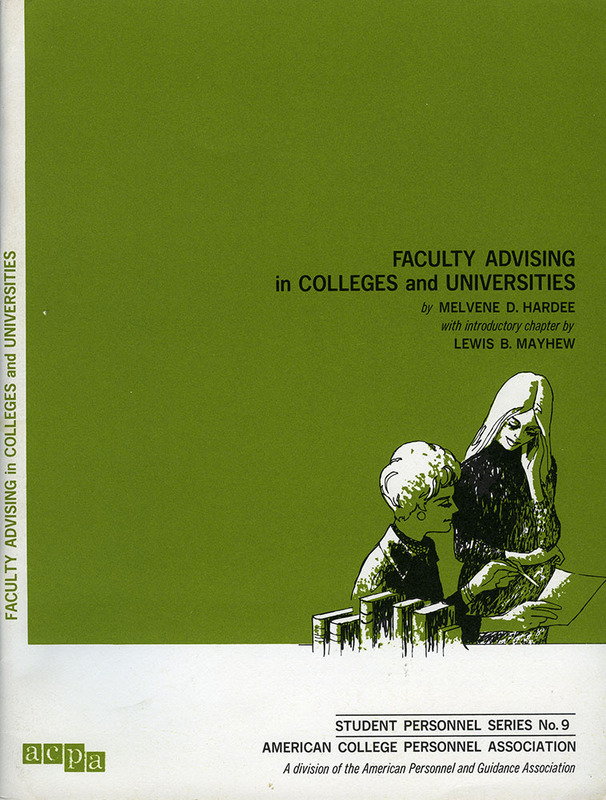 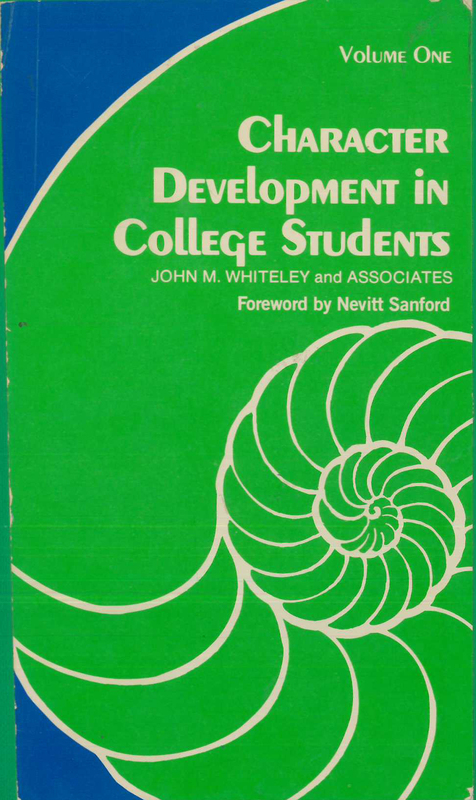 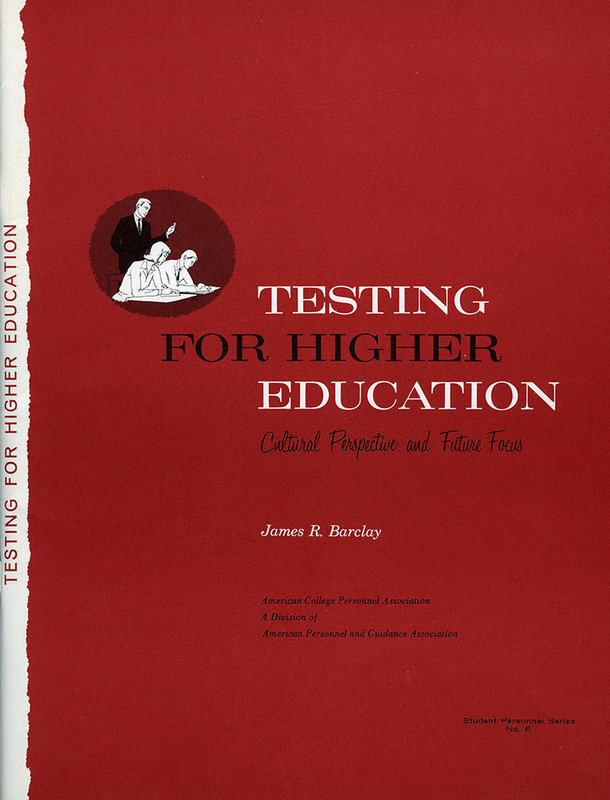 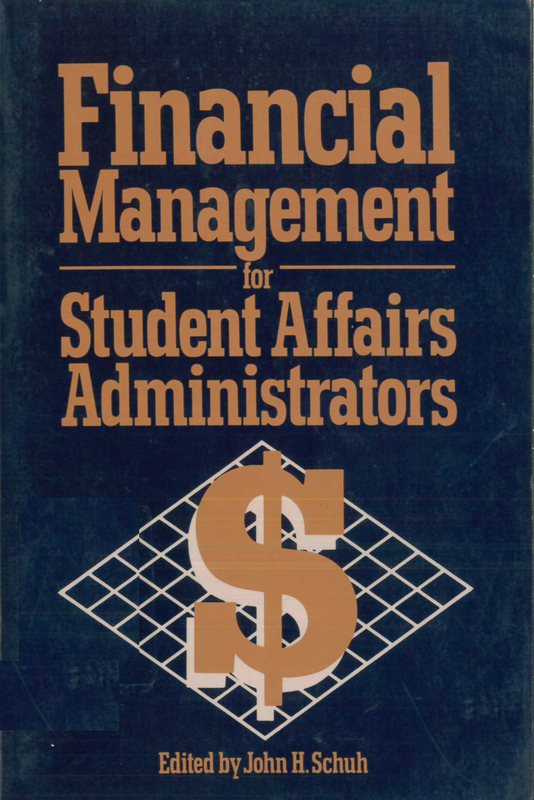 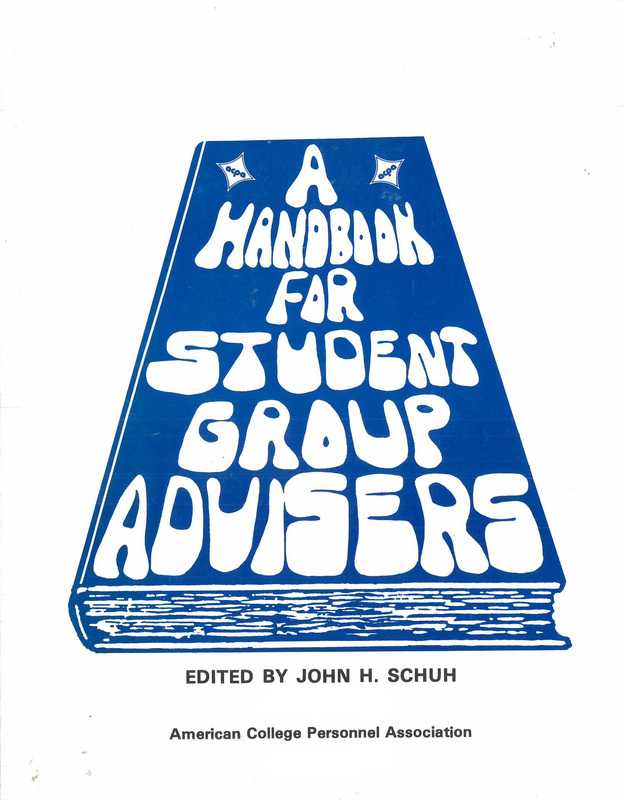 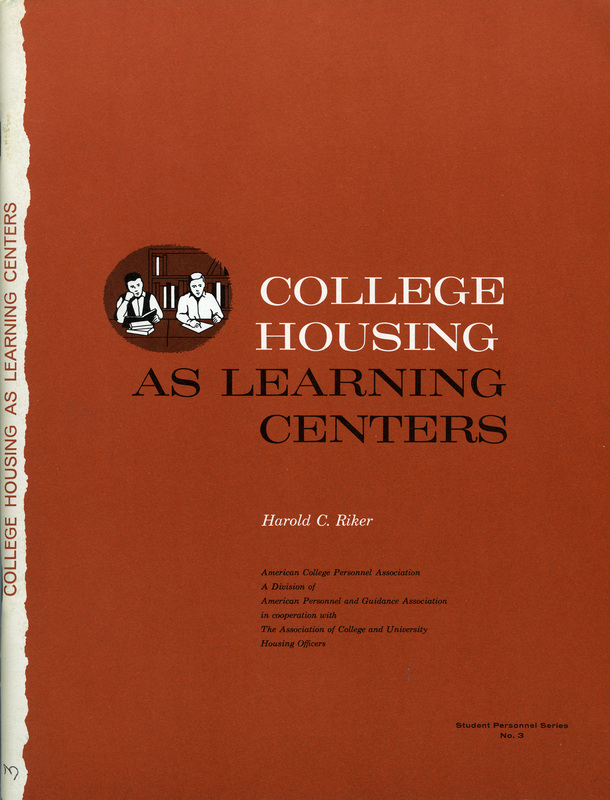 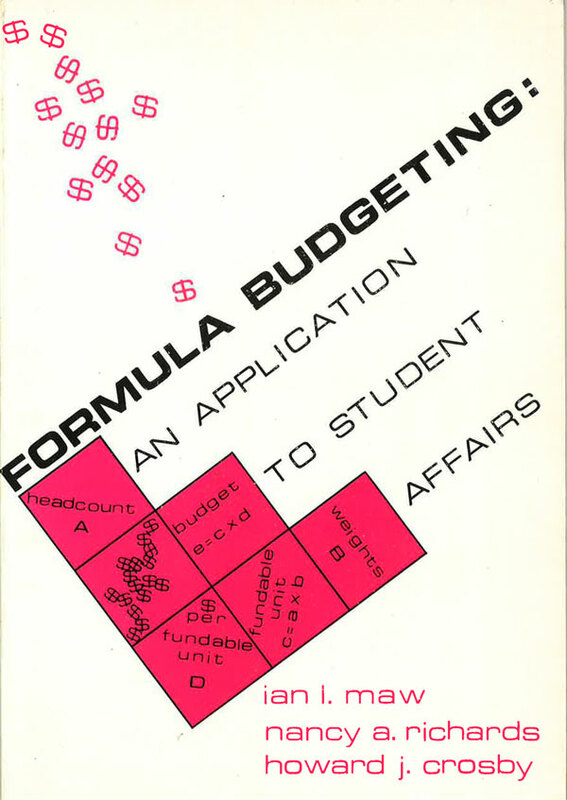 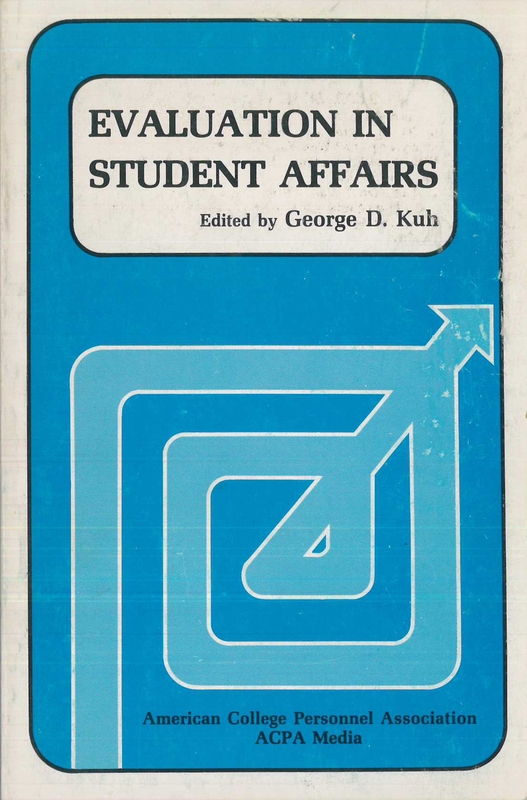 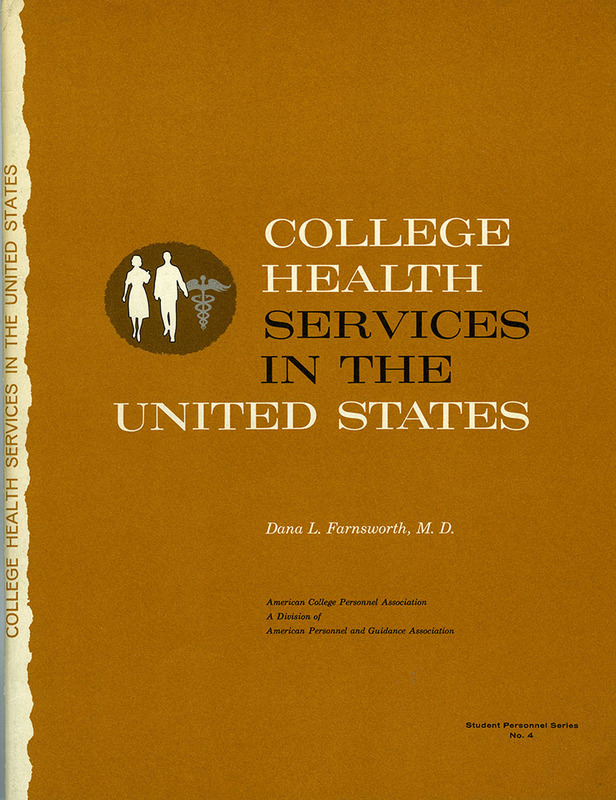 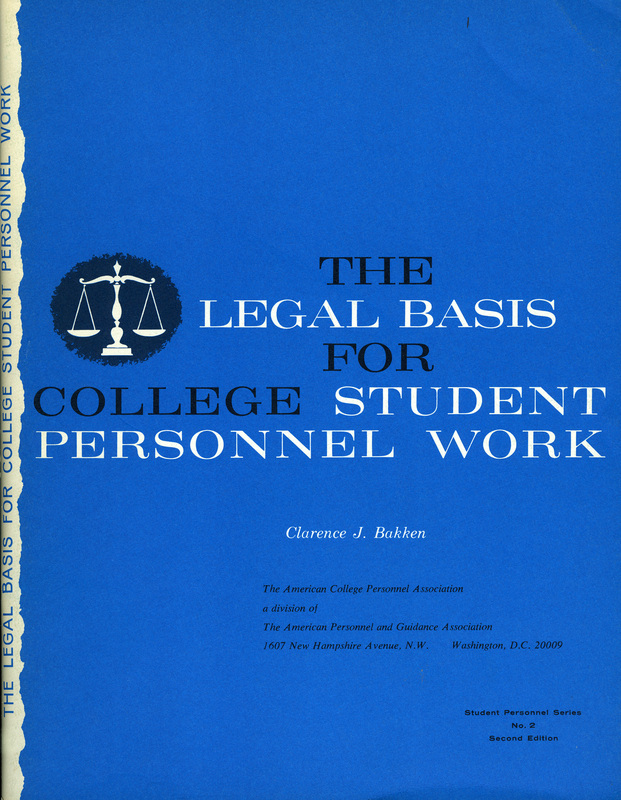 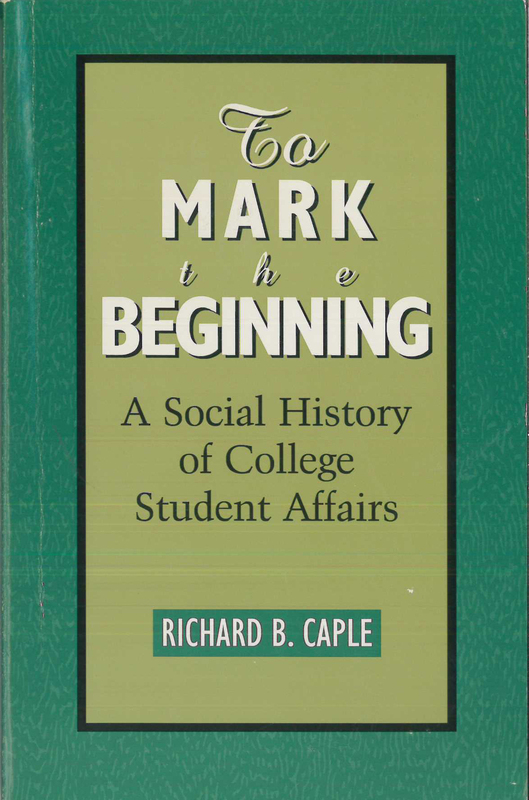 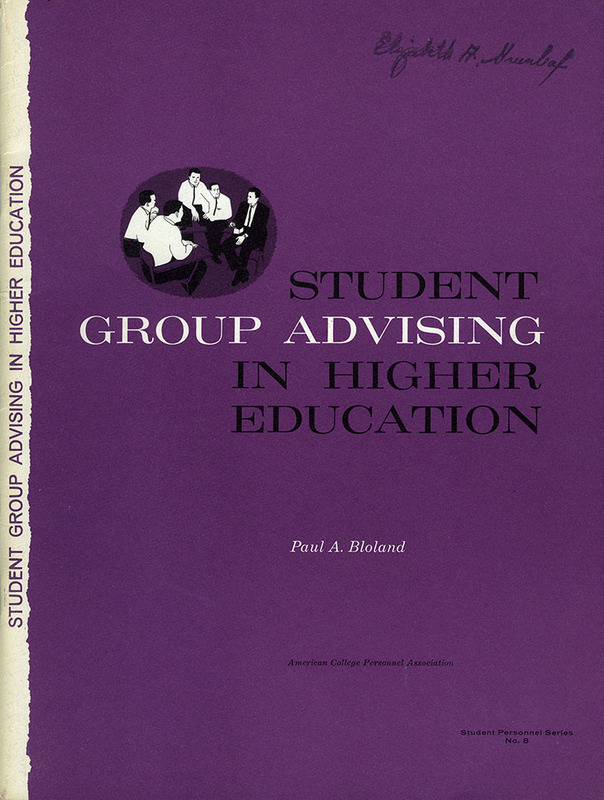 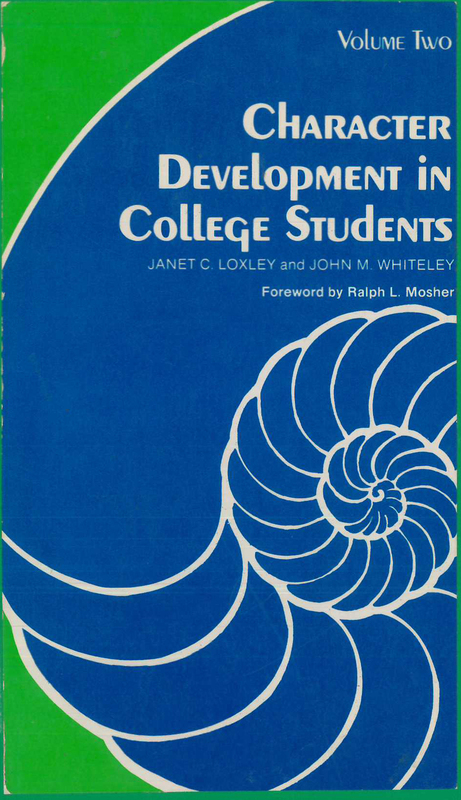 First published in 1969 by the Council of Student Personnel Association for Higher Education, this publication eventually became the responsibility of ACPA's Commission XII-Professional Education of Student Personnel Workers in Higher Education. 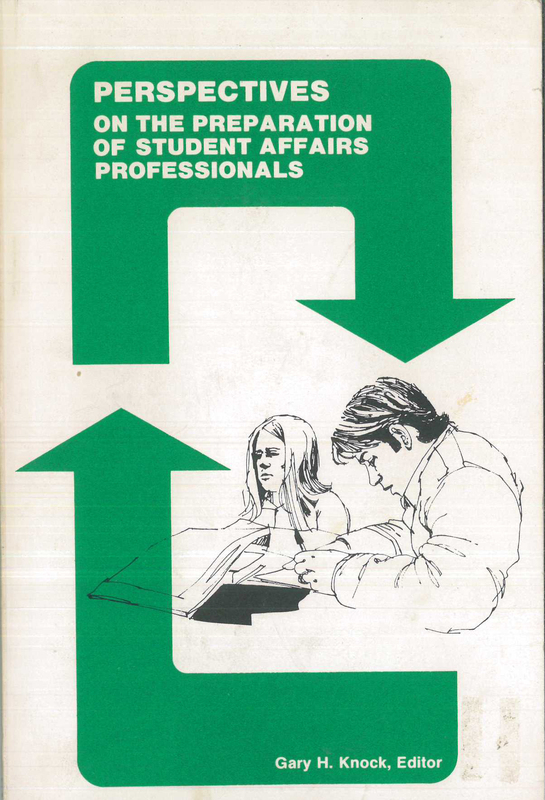 The brief monograph provides an overview of the student development profession including historical context, roles, preparation, and qualifications. 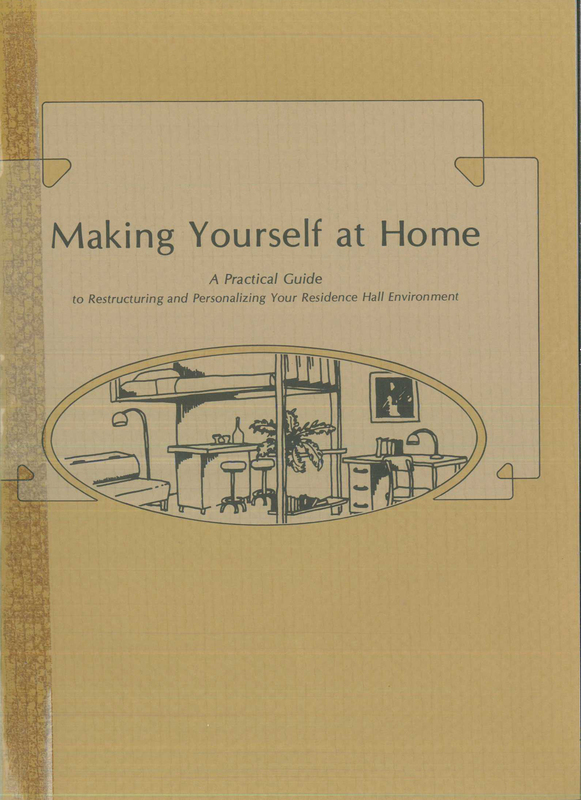 Details are also provided on ten different functional areas. 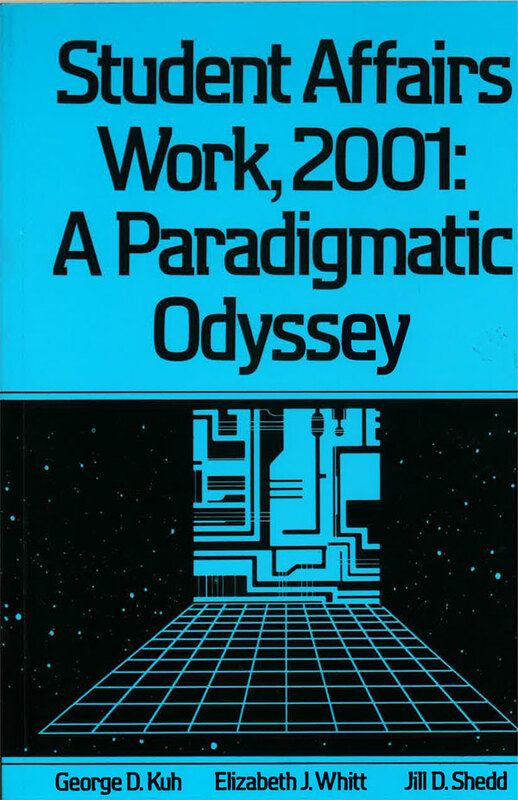 (By Gerald L. Saddlemire and Gary Knock). 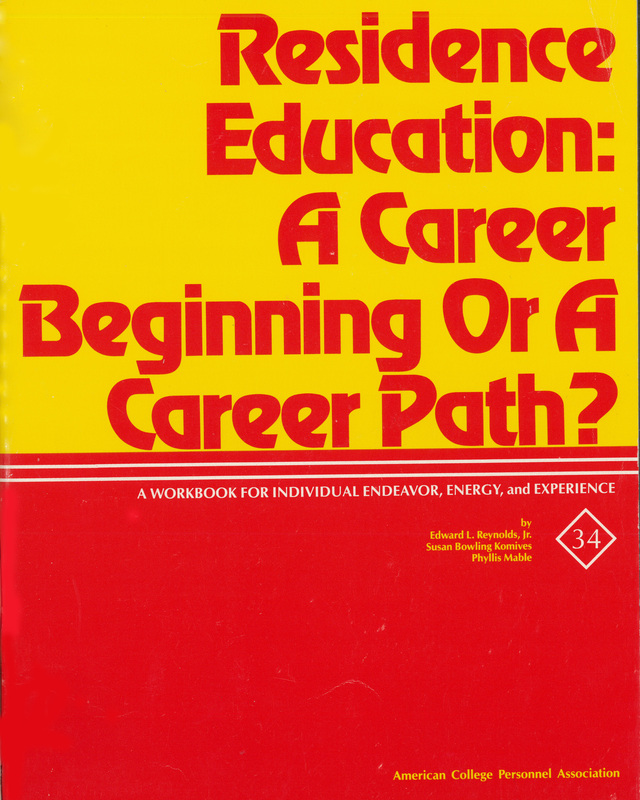 Residence Education: A Career Beginning or a Career Path? 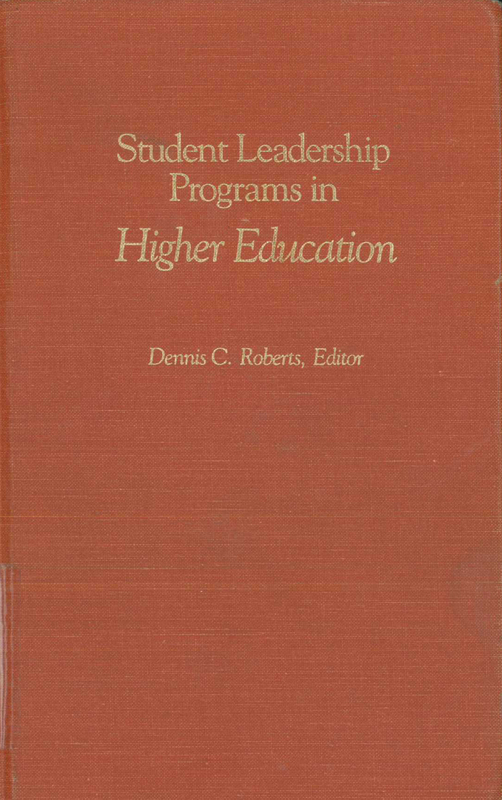 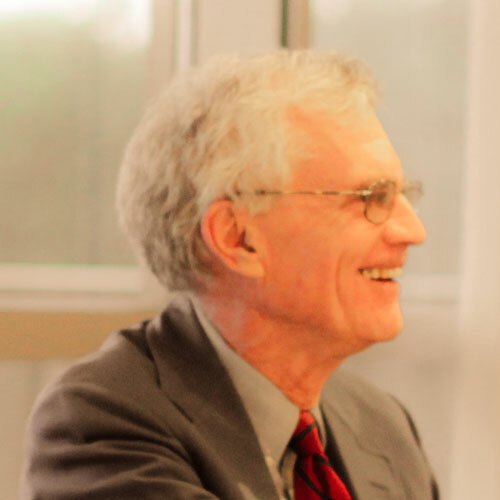 Robert D. Brown served as the Editor of the Journal as it transitioned from The Journal of College Student Personnel to the Journal of College Student Development. 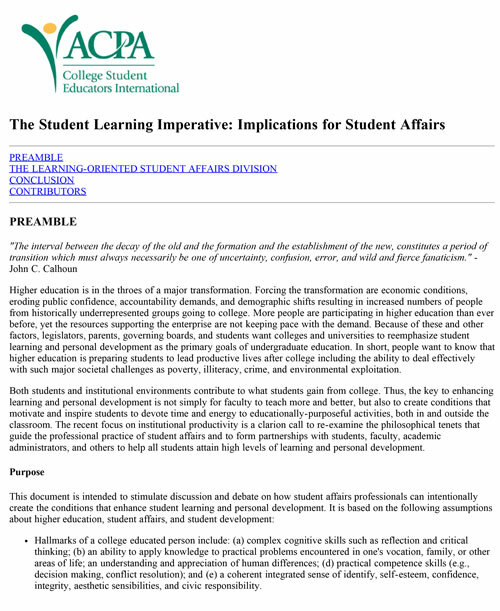 This document is intended to stimulate discussion and debate on how student affairs professionals can intentionally create the conditions that enhance student learning and personal development. 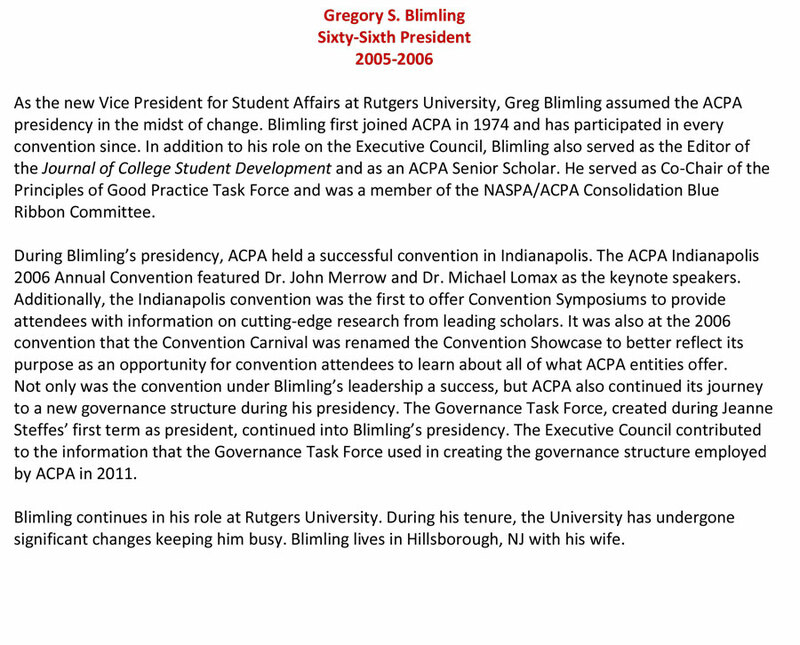 Gregory Blimling served as editor of The Journal of College Student Development for nine years and as a Consulting Editor for a year. 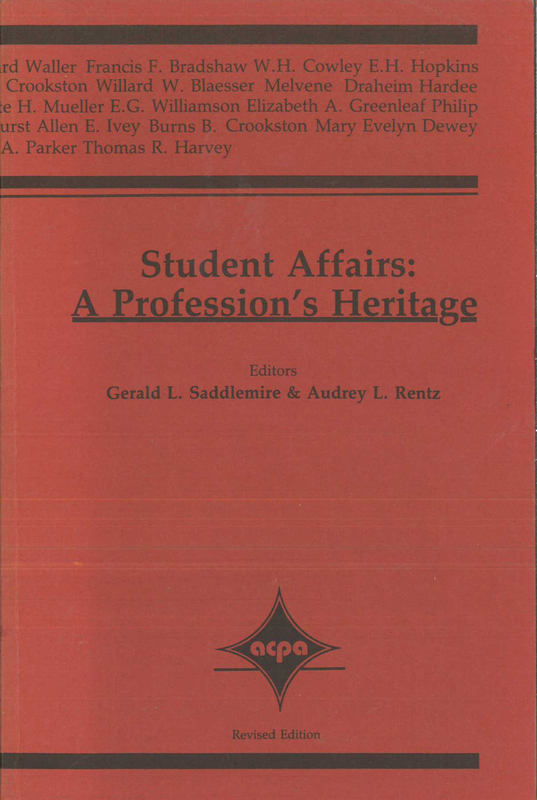 He served the association in numerous ways and remains active as a scholar and practitioner. 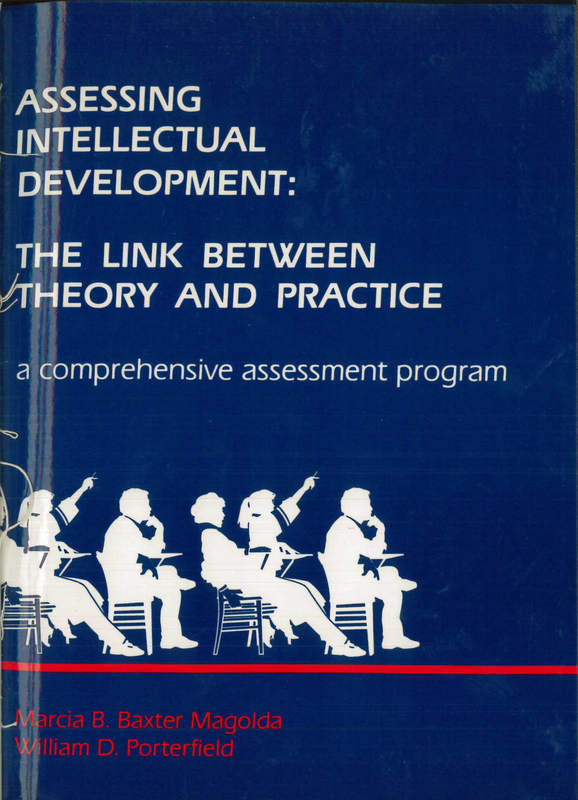 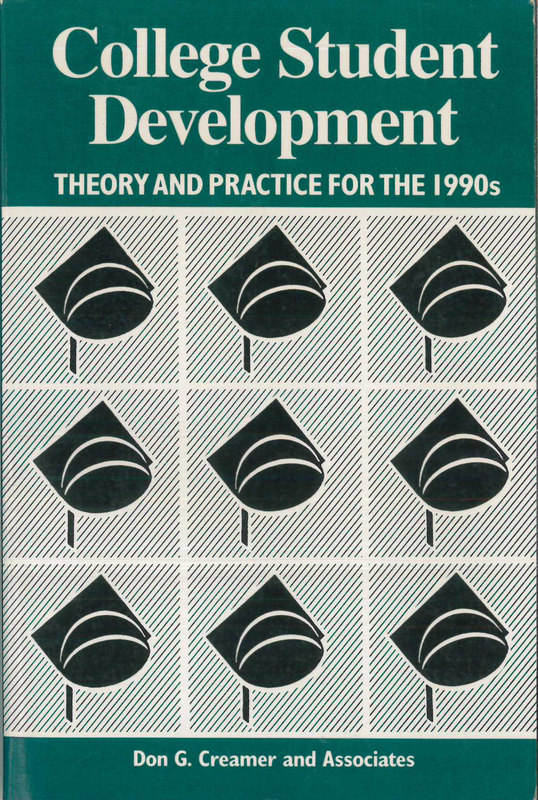 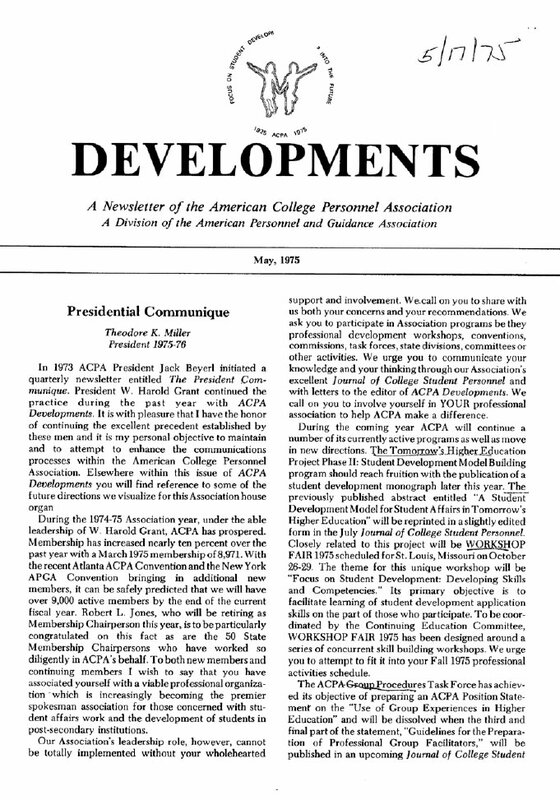 In fall 1992, following ACPA's vote to disaffiliate from AACD (the American Association of Counseling & Development, formerly APGA), President Leila Moore, Charles Schroeder and Terry Williams proposed creation of a new publication (initially titled "ACPA Connections") as a means of solidifying ACPA's goal of being the "preeminent provider of timely, focused and relevant professional development." 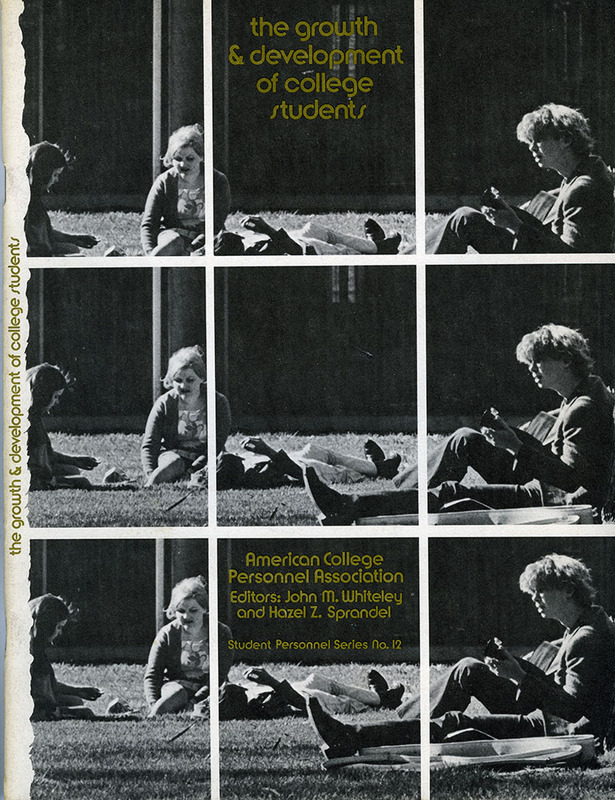 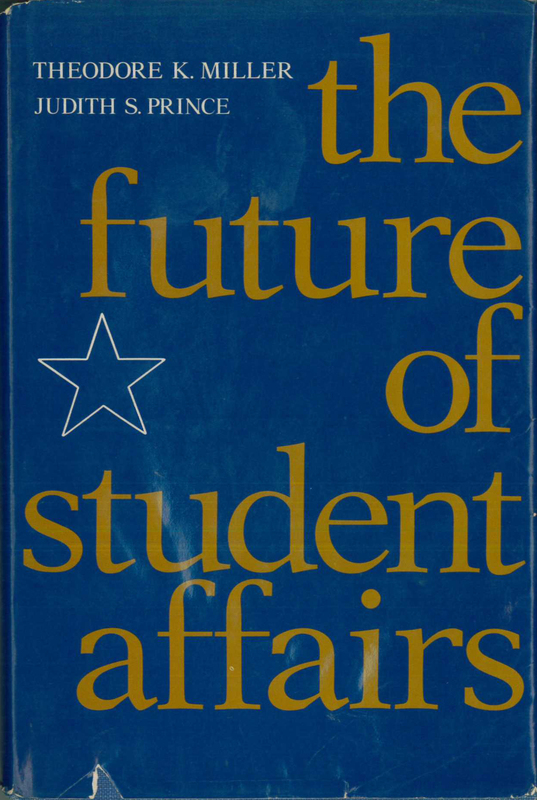 What came to be known as About Campus was conceived as a magazine-format publication that would examine emerging trends, critical and "controversial" issues, and interviews with higher education and student affairs leaders. 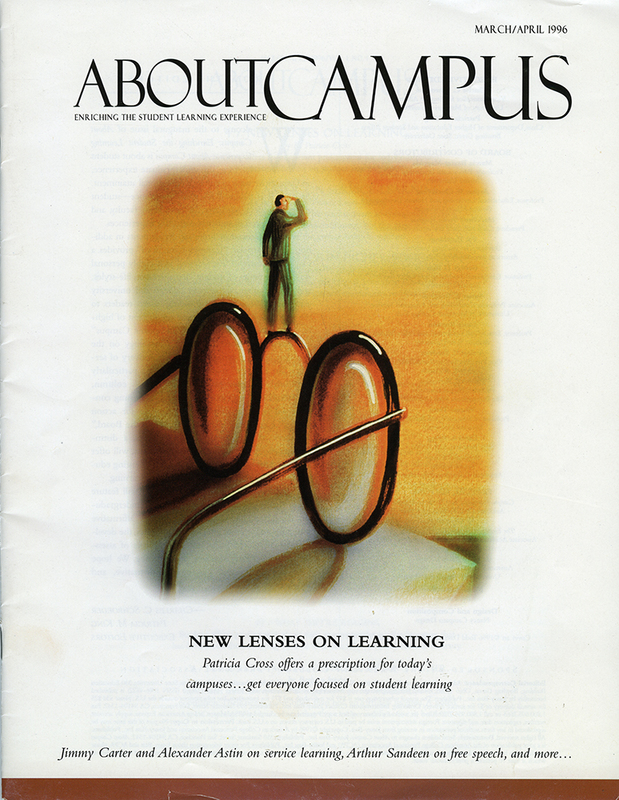 About Campus is recognized as one of the most widely read and circulated publications addressing issues related to campus life and student learning. 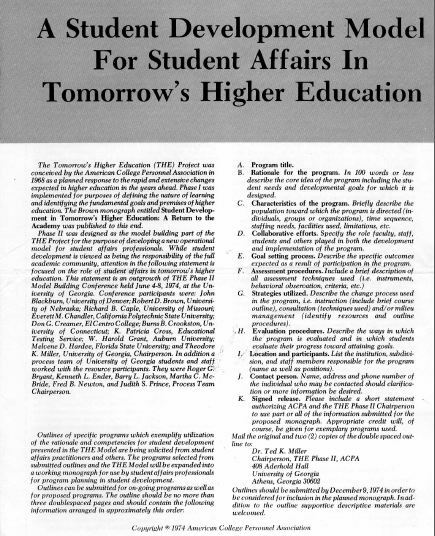 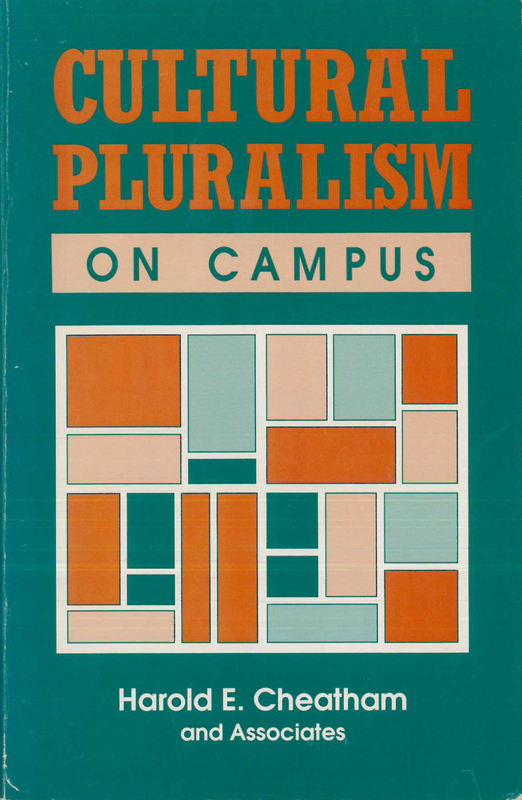 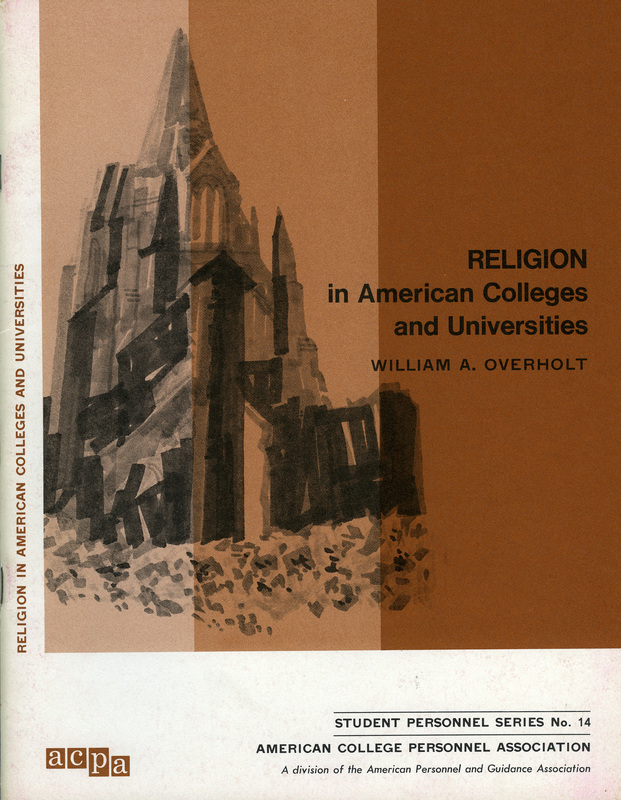 Download a brief history regarding the creation of About Campus (PDF). 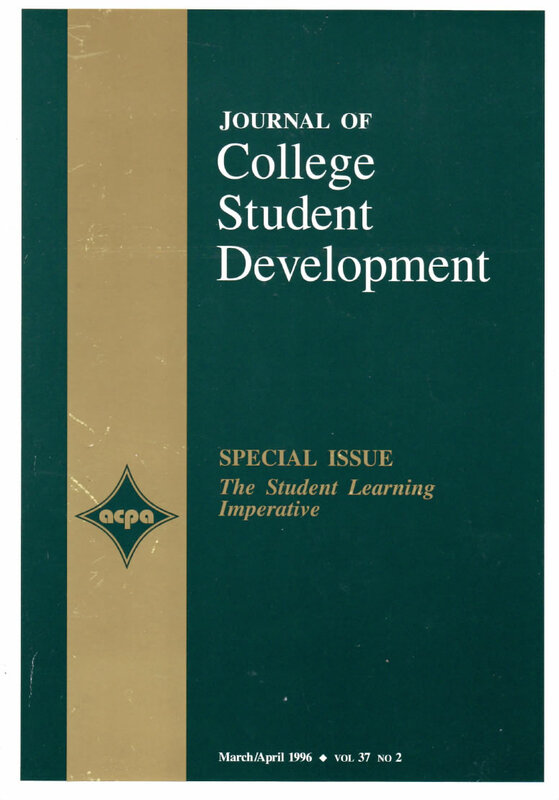 This special issue focused on the implications of the Student Learning Imperative for the practice of Student Affairs. 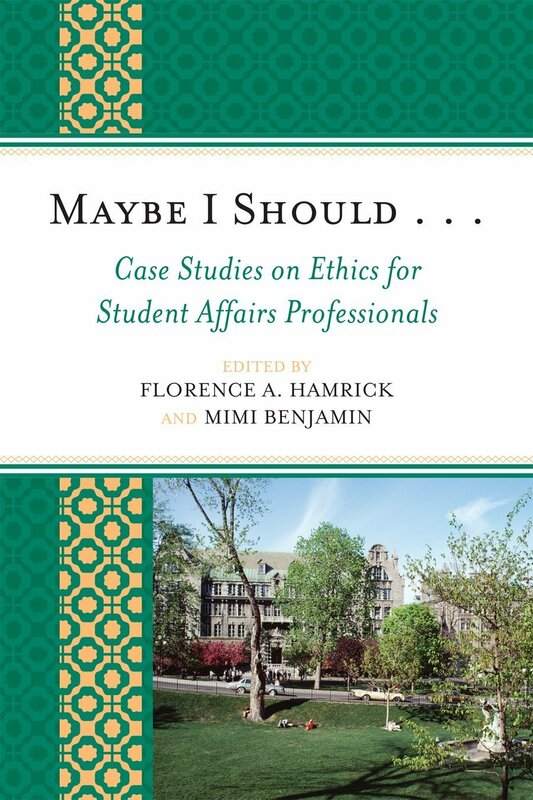 The authors were asked to answer: What do our colleges and universities need from student affairs educators? 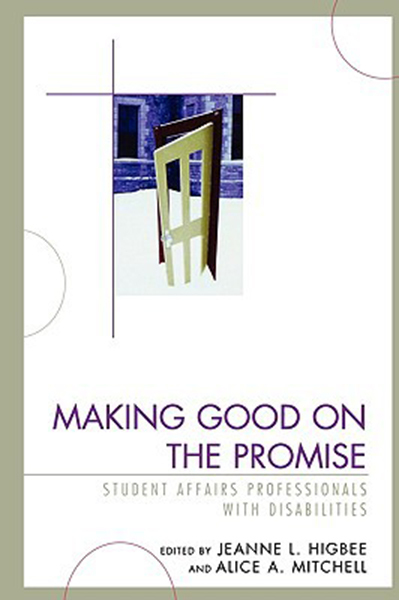 To collaborate with others in higher education to advance student learning, ACPA and NASPA produced Principles of Good Practice for Student Affairs. 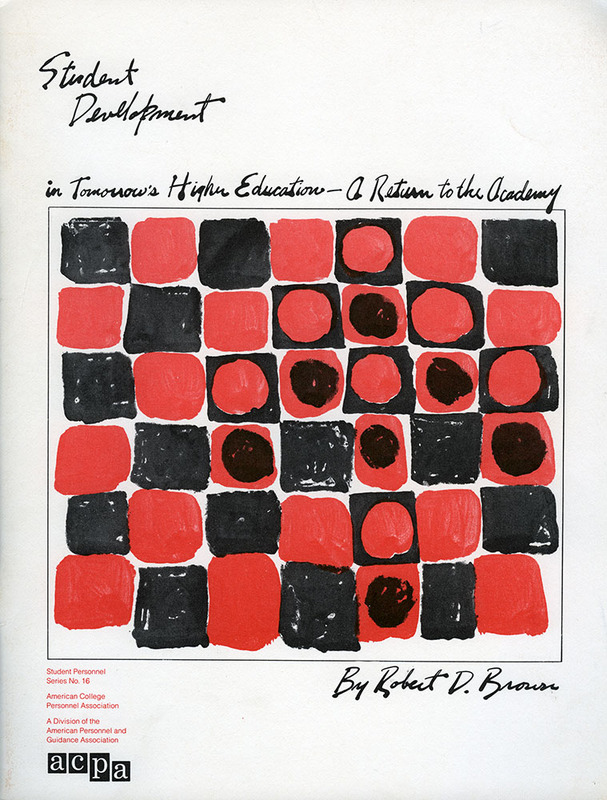 Despite American higher education's success at providing collegiate education for an unprecedented number of people, the vision of equipping all our students with learning deep enough to meet the challenges of the post-industrial age provides us with a powerful incentive to do our work better. 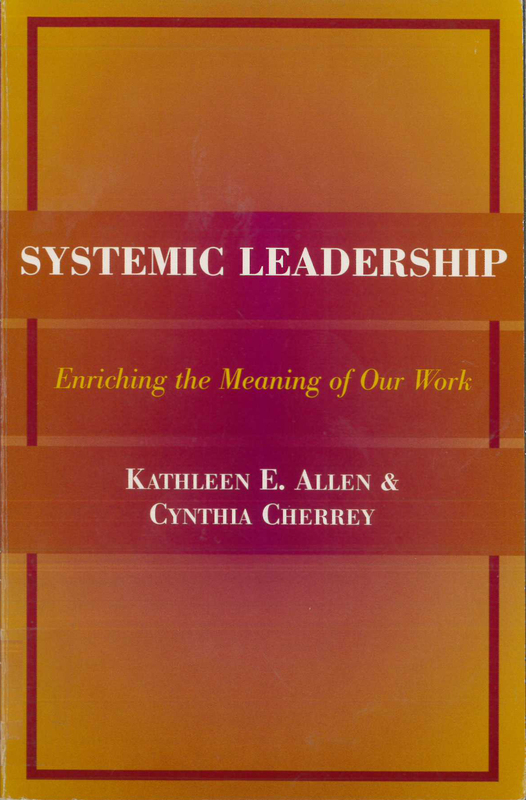 People collaborate when the job they face is too big, is too urgent, or requires too much knowledge for one person or group to do alone. 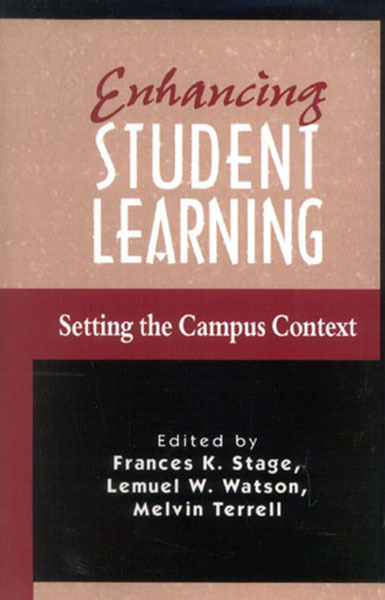 Marshalling what we know about learning and applying it to the education of our students is just such a job. 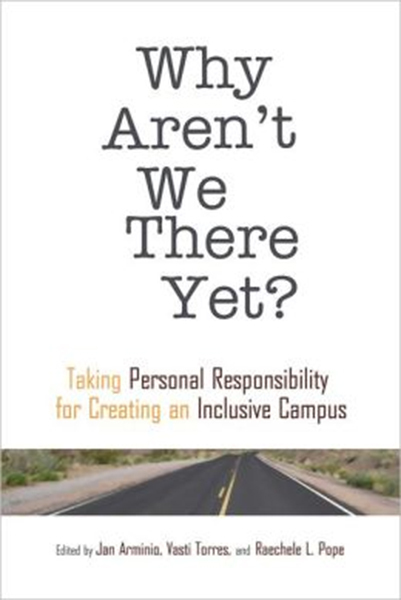 This report makes the case that only when everyone on campus -- particularly academic affairs and student affairs staff--shares the responsibility for student learning will we be able to make significant progress in improving it. 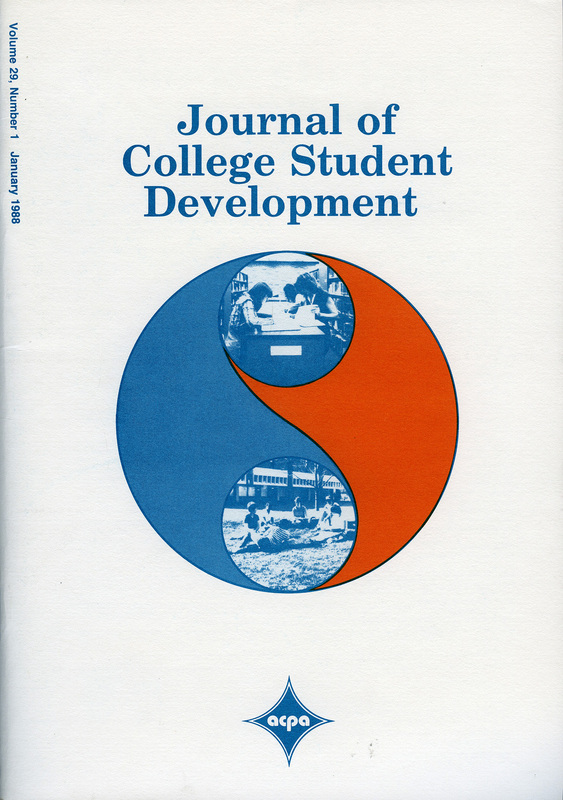 Seventeen articles were selected that were representative of some of the best articles that appeared in the Journal over the past forty years. 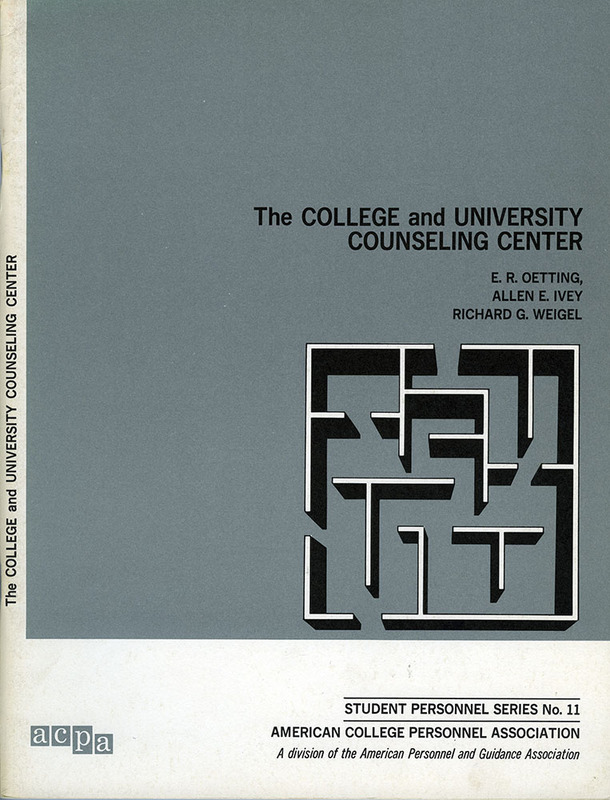 The editorial process for choosing the articles took almost a year. 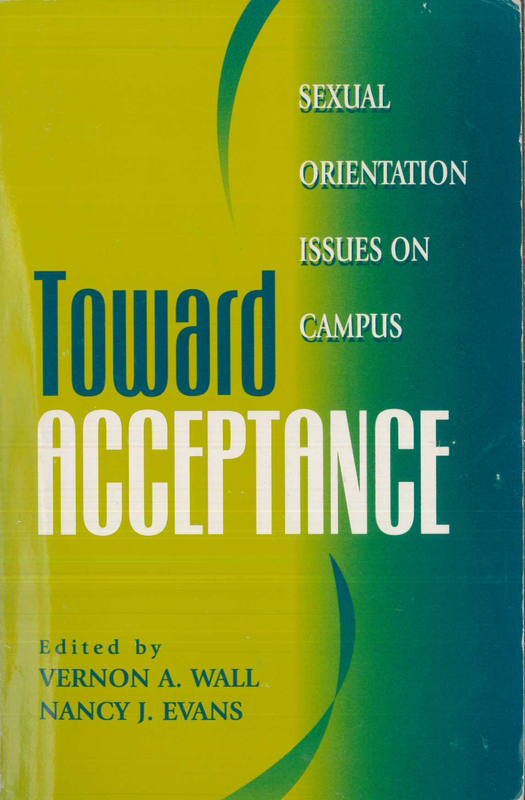 After Ernest Boyer raised the issue of what constitutes scholarship and how it is used in his 1990 book, Scholarship Reconsidered: Priorities of the Professorate, five Senior Scholars of ACPA were asked to write papers for the 2001 convention and other senior scholars were invited to respond to these papers. 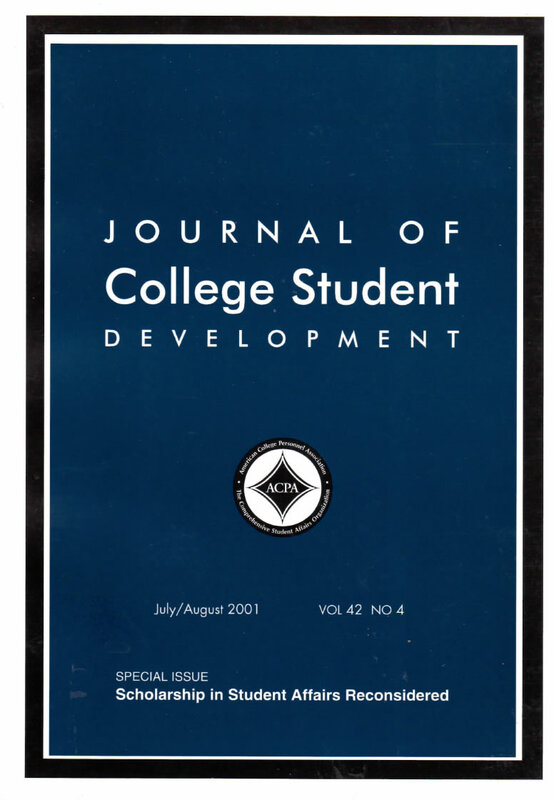 The conference papers provoked debate about what constitutes scholarship in student affairs and JCSD devoted a special issue to the papers and reactions. 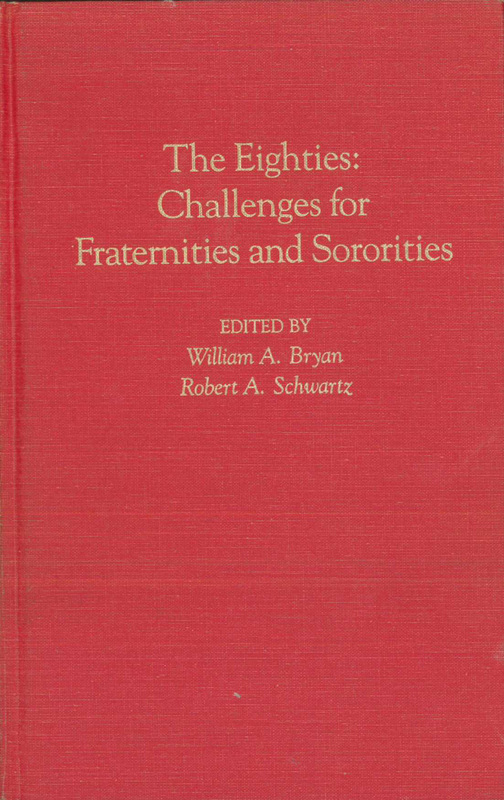 With Volume 28, No. 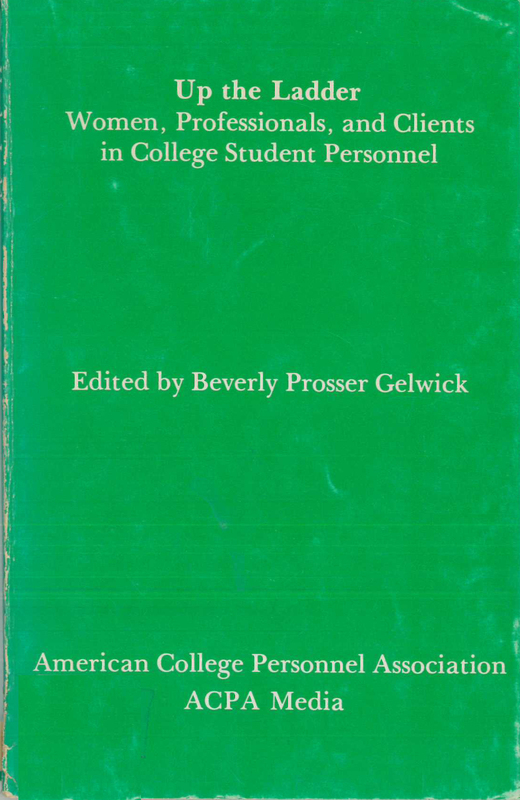 4, under the editorship of Heidi Levine, Developments became electronically formatted and disseminated. 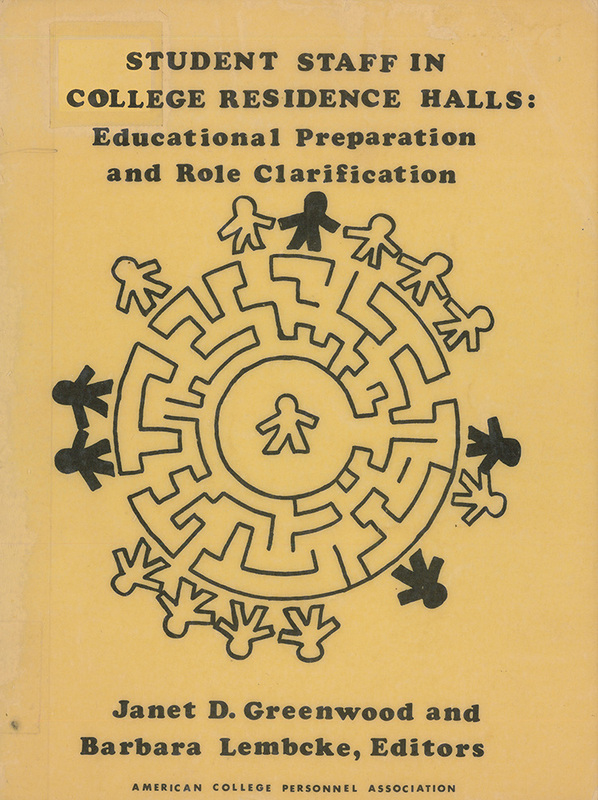 Learning Reconsidered is an argument for the integrated use of all of higher education's resources in the education and preparation of the whole student. 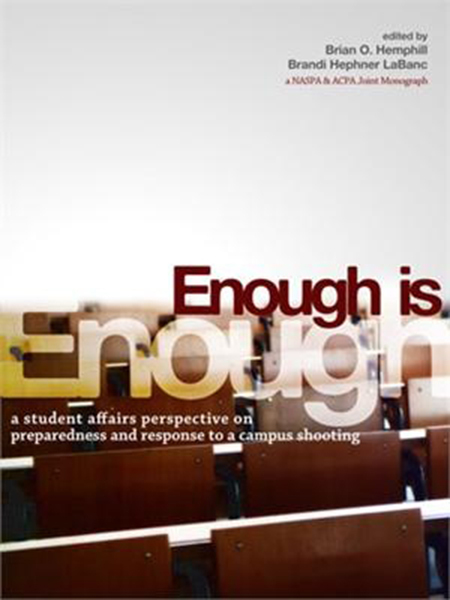 This is a co-published publication between ACPA and NASPA. 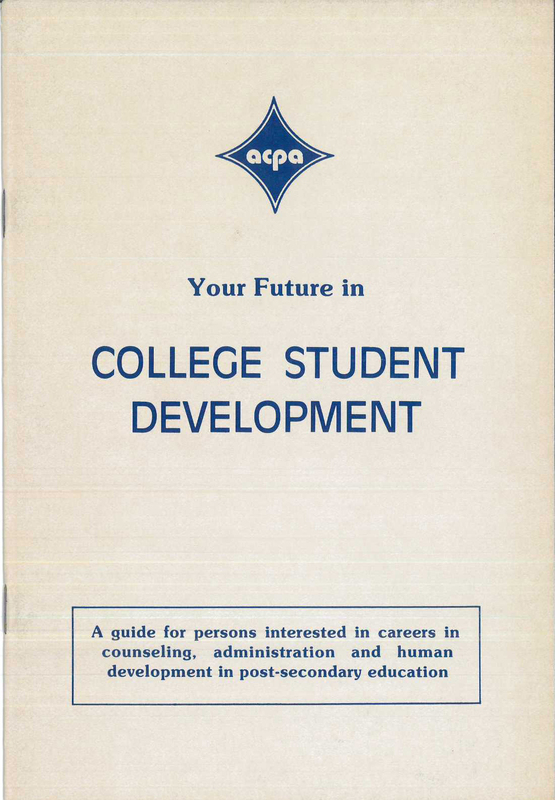 ACPA Developments, under editor Richie Stevens, moved from an electronic pdf format to a navigable, web format. 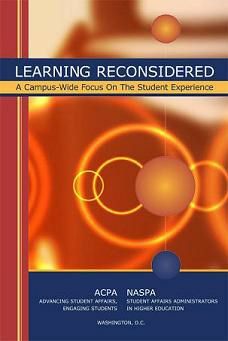 Learning Reconsidered 2: Implementing a Campus-Wide Focus on the Student Experience is a blueprint for action. 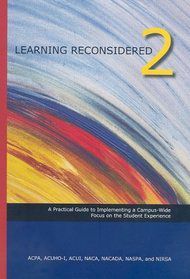 It shows how to create the dialogue, tools, and materials necessary to put into practice the recommendations in Learning Reconsidered. 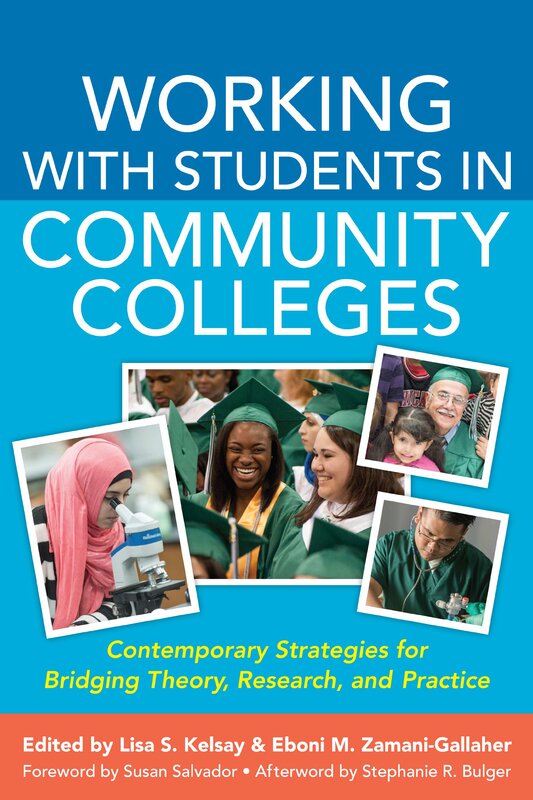 This companion book brings together new authors, discipline-specific examples, and models for applying the theories in the original publication to move beyond traditional ideas of separate learning inside and outside the classroom. 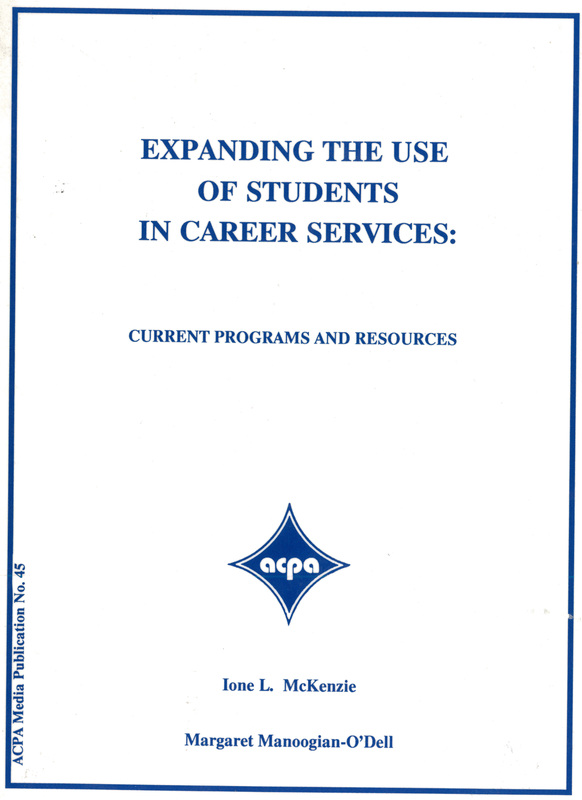 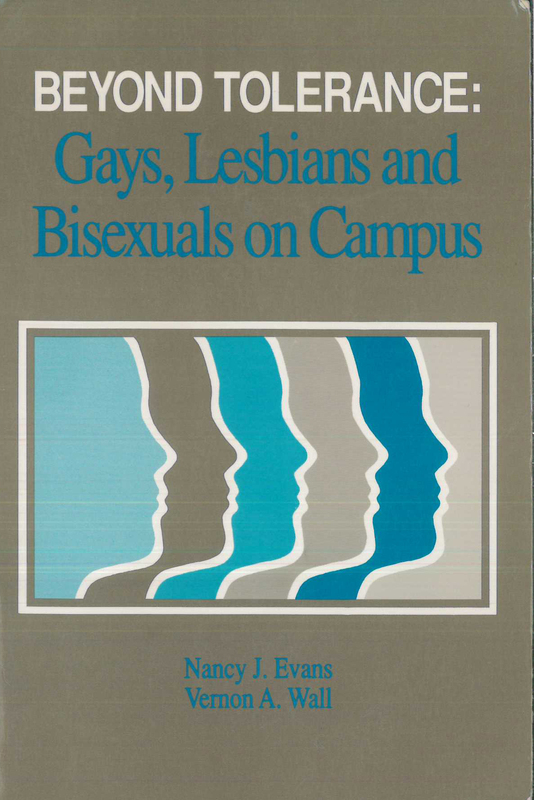 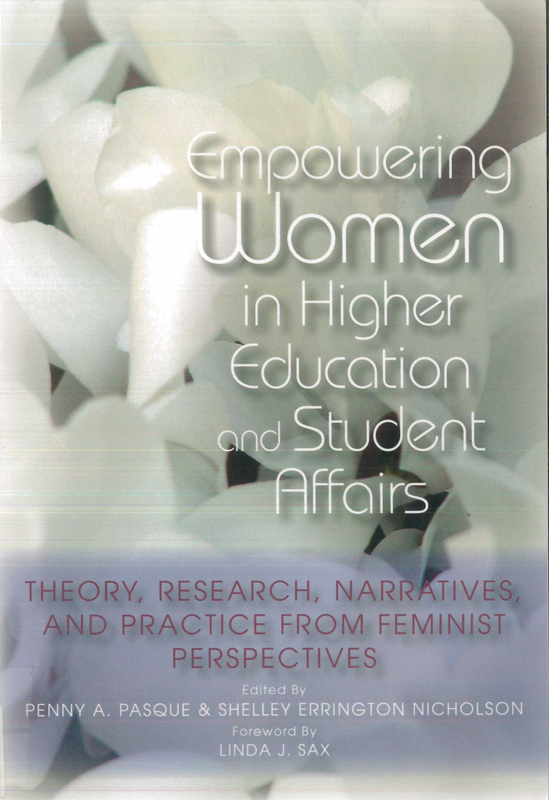 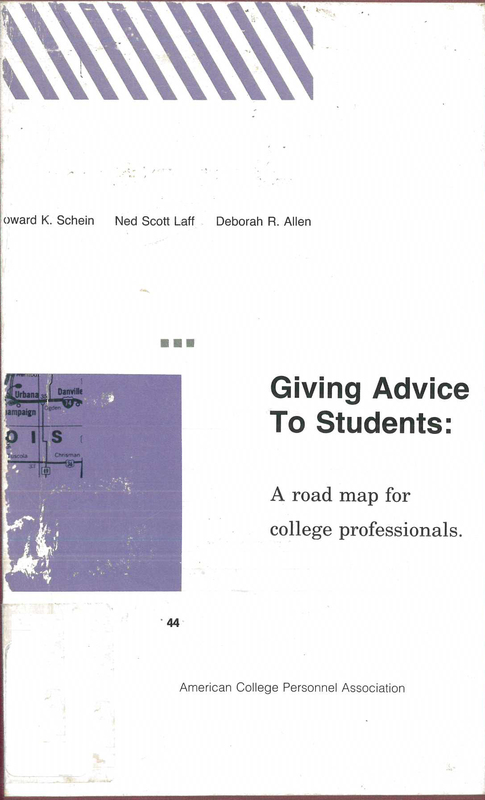 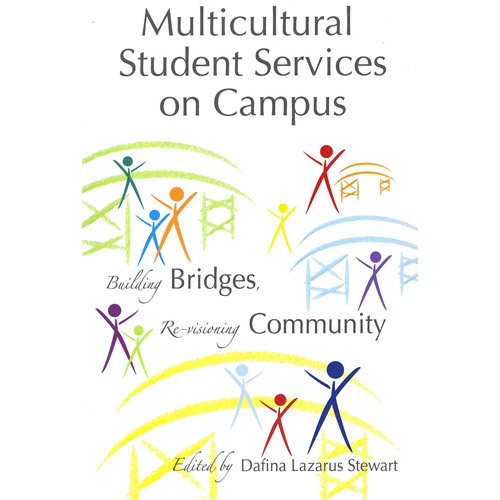 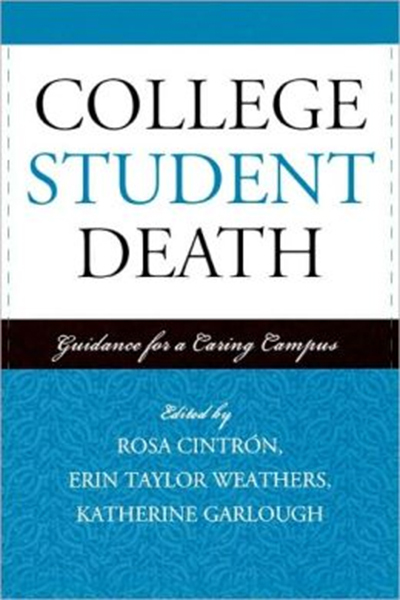 Published by ACPA, ACUHO-I, ACUI, NACADA, NACA, NASPA, and NIRSA. 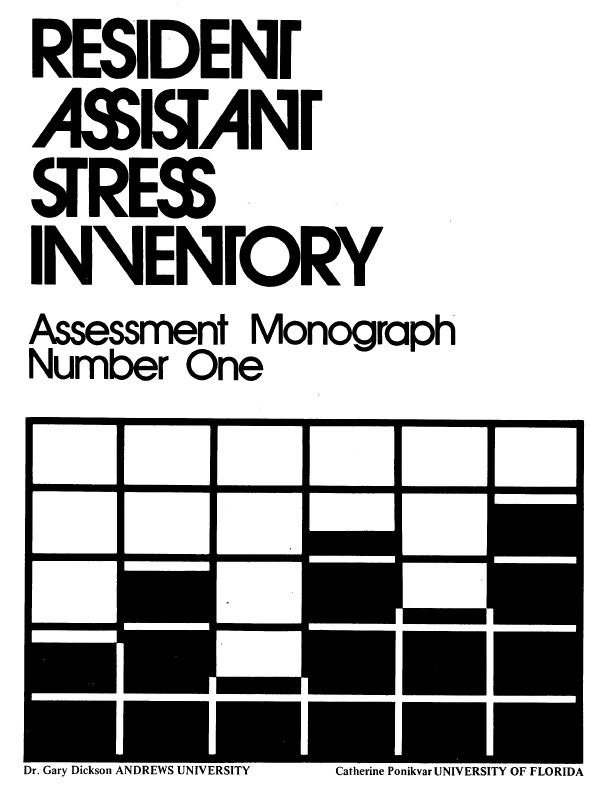 Use ASK intentionally as a basis to further develop your assessment knowledge and that of your staff. 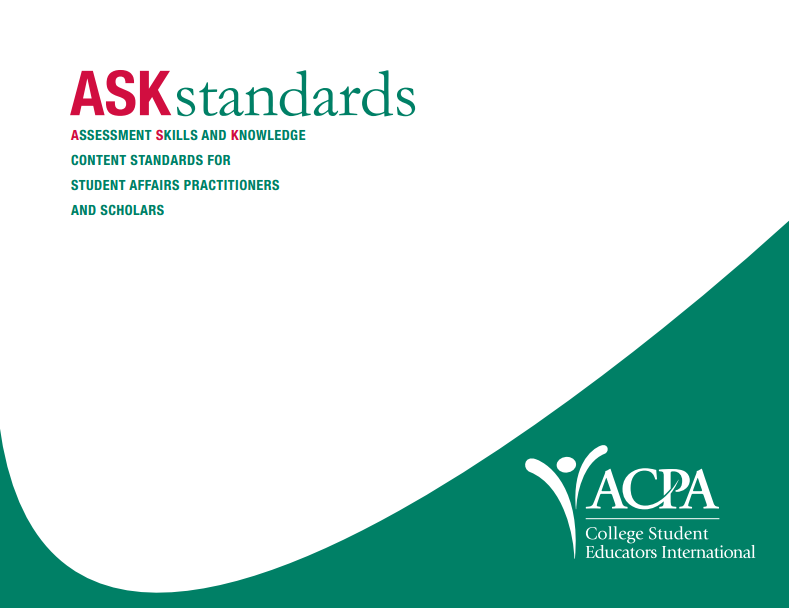 Endorsed by national accrediting bodies, associations, and assessment experts, the ACPA ASK Standards articulate the areas of assessment skills and knowledge (ASK) needed by student affairs professionals in all functional areas as well as by others. 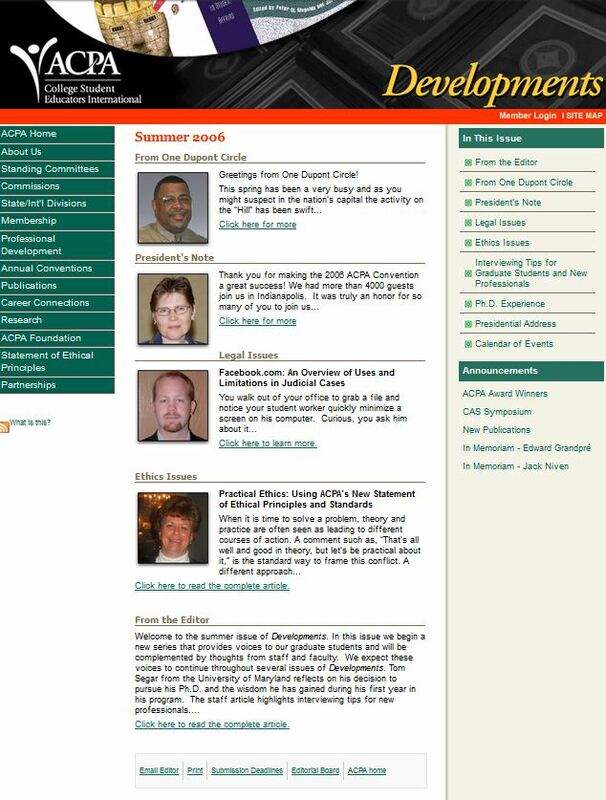 Use ASK to plan staff training or your own further development through ACPA eLearning courses, Webinars, State/International division conferences, and the annual ACPA assessment conference. 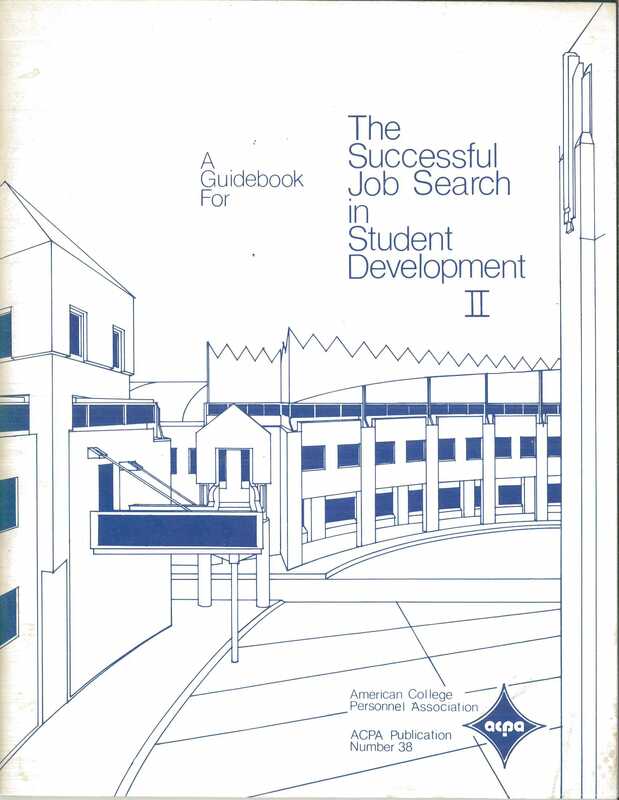 ASK is your "what do I need to know?" 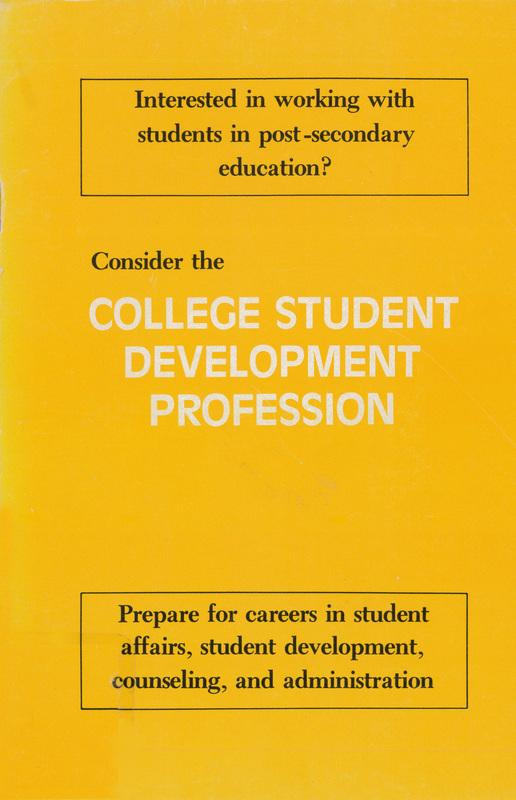 professional development road map! 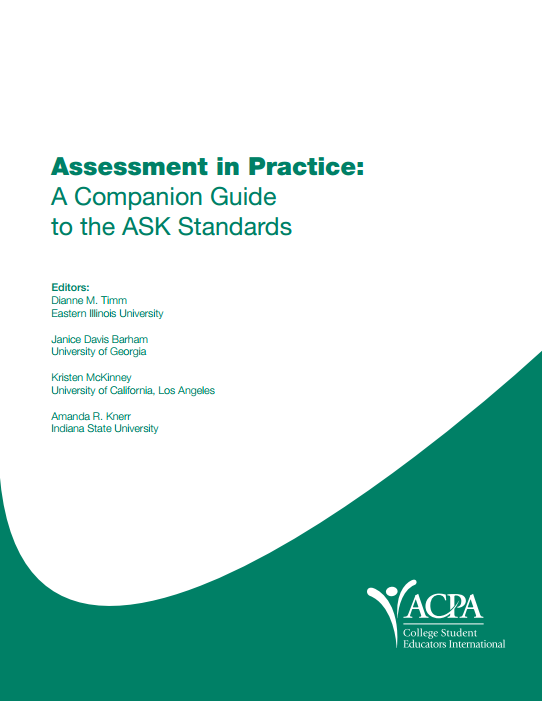 ASK is a member service from the ACPA Commission for Assessment and Evaluation. 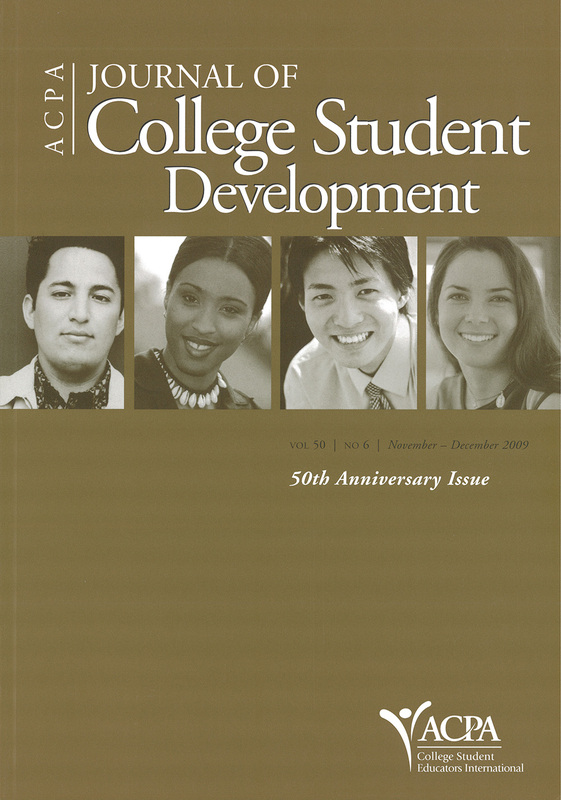 The six articles of this special issue focused on factors related to the development of the whole person. 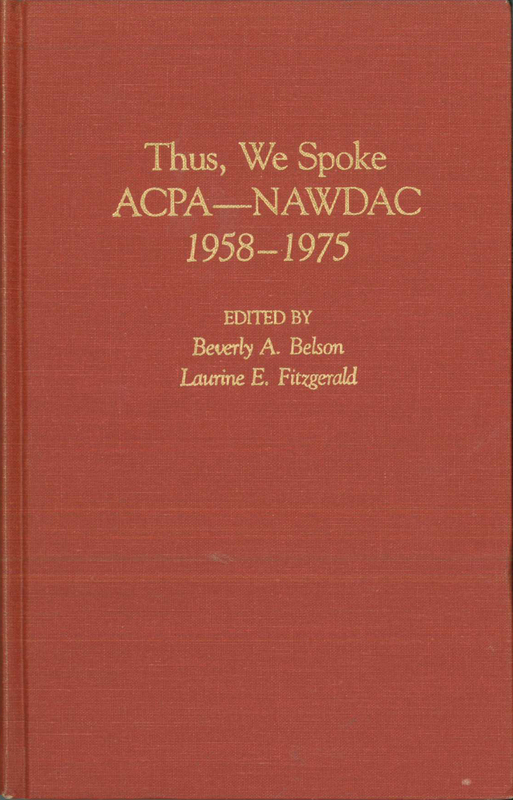 The authors provided a historical overview, summary of current research and scholarship, and recommendations for future research and scholarship. 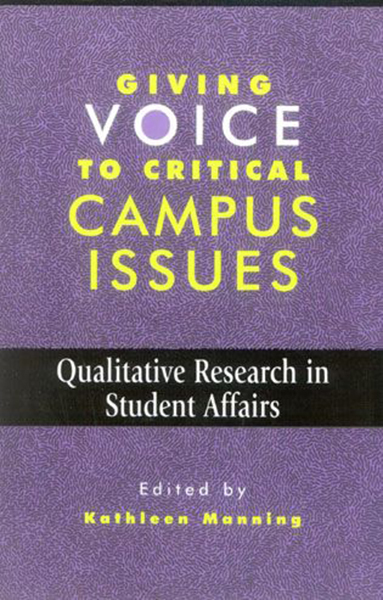 They addressed key domains of research and scholarship representing a wide range of practice within the field of student affairs. 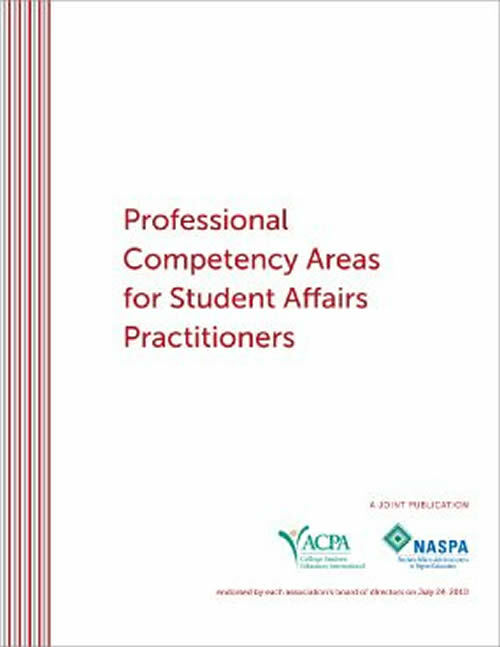 This set of Professional Competency Areas is intended to define the broad professional knowledge, skills, and for some competencies, attitudes expected of student affairs professionals working in the U.S., regardless of their area of specialization or positional role within the field. 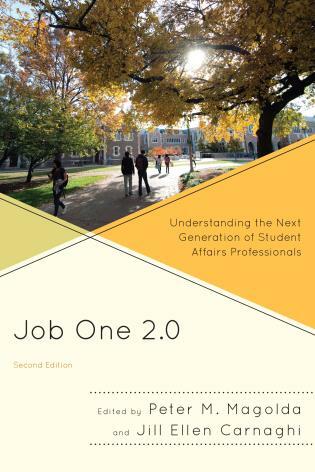 All student affairs professionals should be able to demonstrate their ability to meet the basic list of outcomes under each competency area regardless of how they entered the profession. 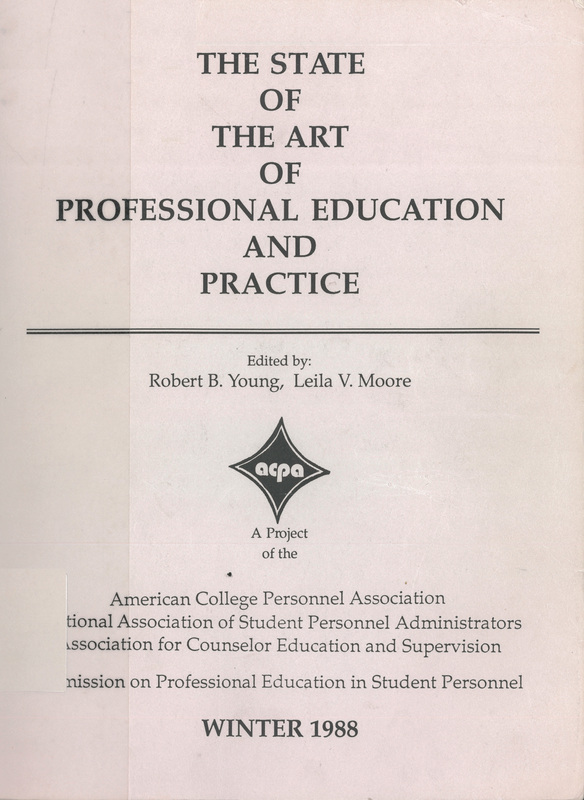 Thus, this document is intended to inform the design of professional development opportunities for student affairs professionals by providing outcomes that can be incorporated into the design of specific curriculum and training opportunities. 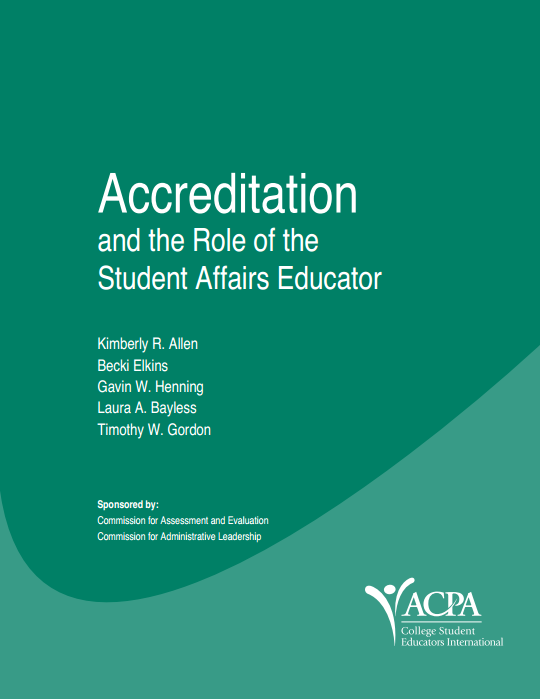 With increased emphasis on student affairs’ contribution to student learning, increasing numbers of student affairs educators are being called upon to participate in the regional accreditation process. 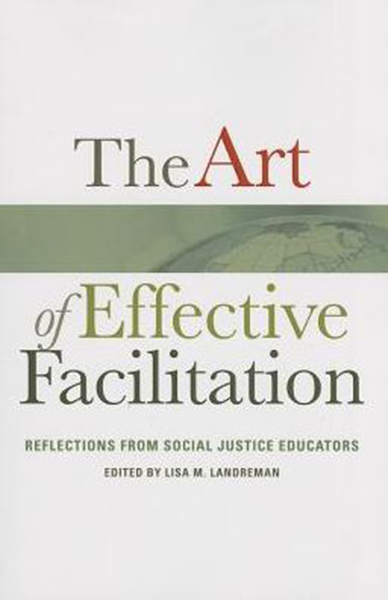 With accreditation processes taking place once a decade and recent revisions in the standards for regional accrediting bodies focusing on student learning, student affairs educators are often not equipped with the knowledge and skills to maximize the opportunity that accreditation presents divisions of student affairs. 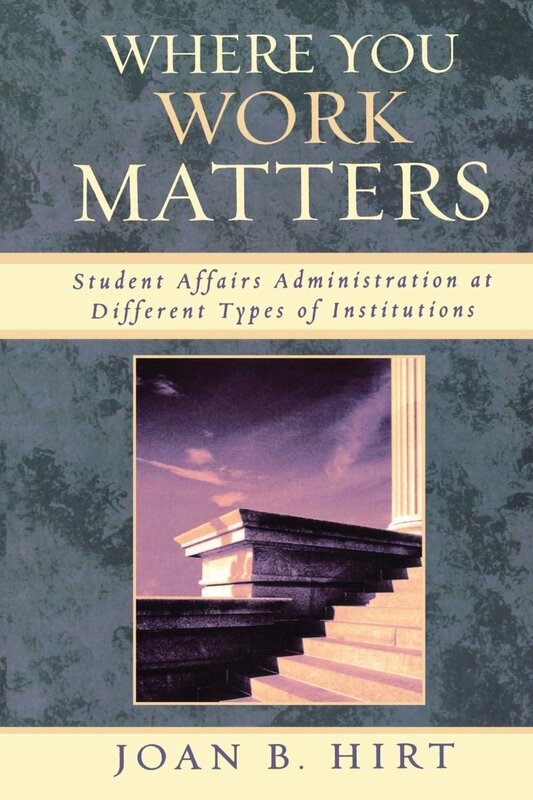 Without these skills and knowledge, this opportunity is lost and student affairs educators merely “endure and get through” the process. 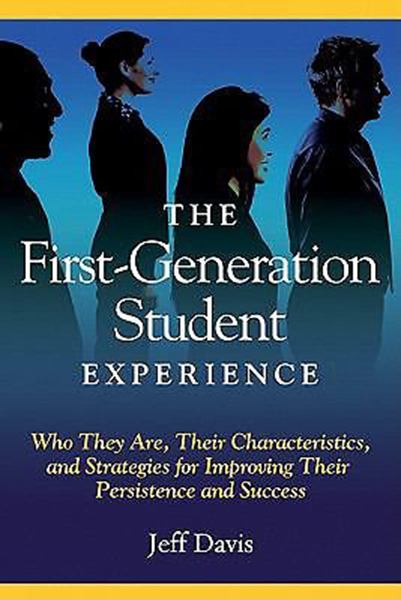 Colleges today are asked to provide greater proof that they are providing quality educational experiences to their students. 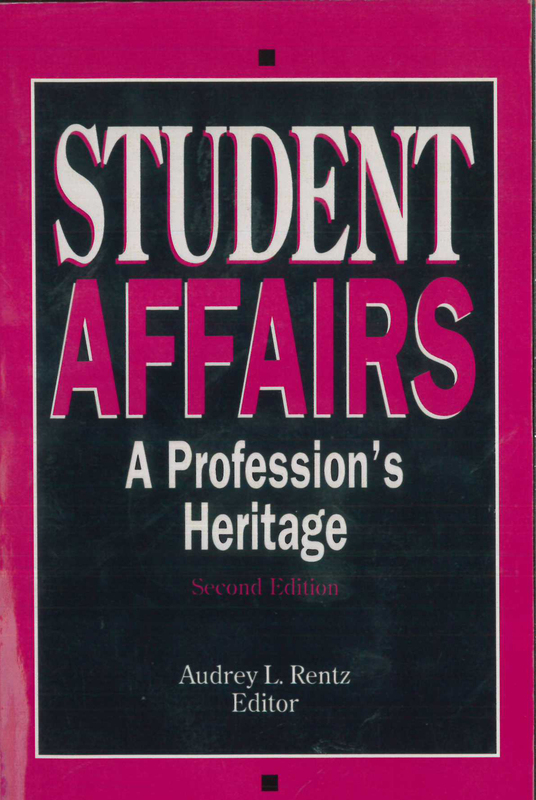 There has been a growing need for student affairs to provide documentation that their areas also impact learning and student experience. 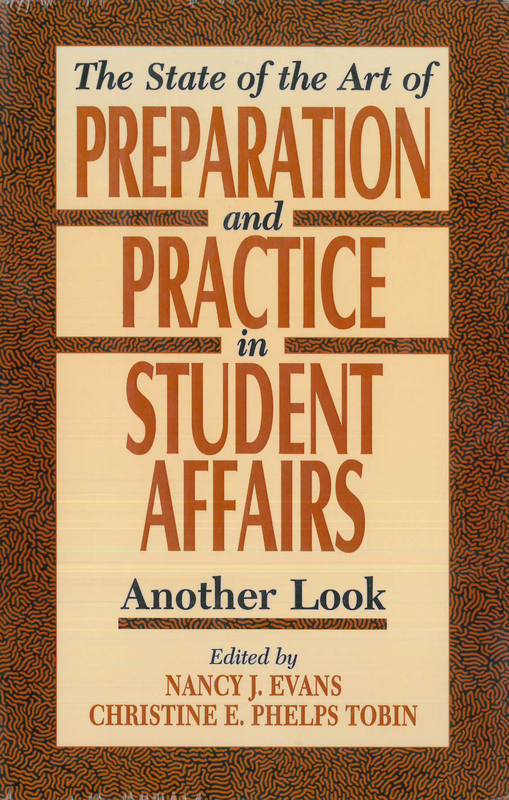 However, many student affairs professionals are overwhelmed by the idea of assessment and are looking for examples of best practices in this area. 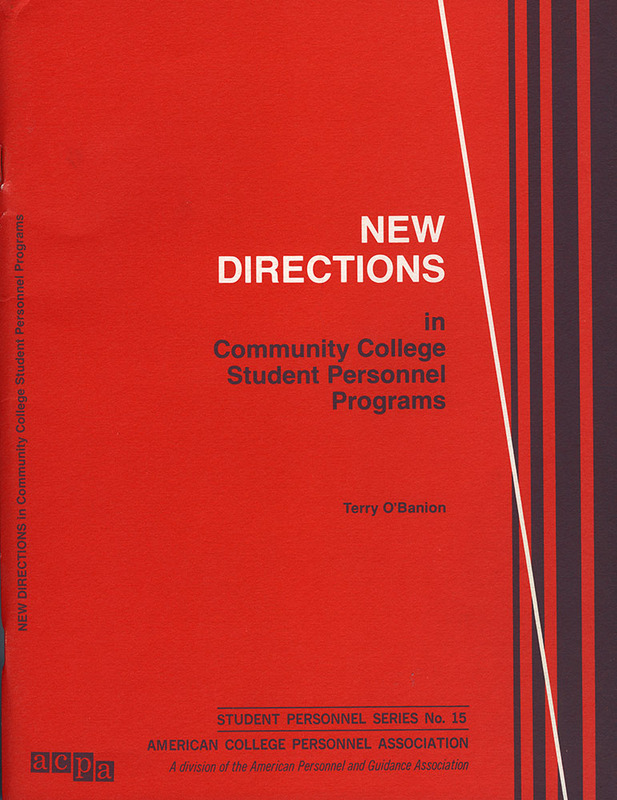 Several years ago the American College Personnel Association’s Commission Directorate for Assessment and Evaluation developed the Assessment Skills and Knowledge Standards for practitioners. 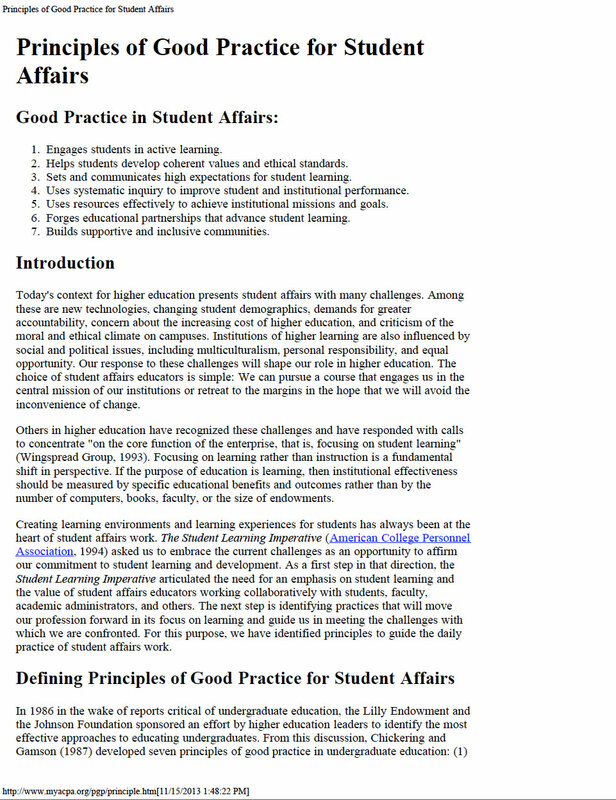 This document provides examples of these standards in practice.